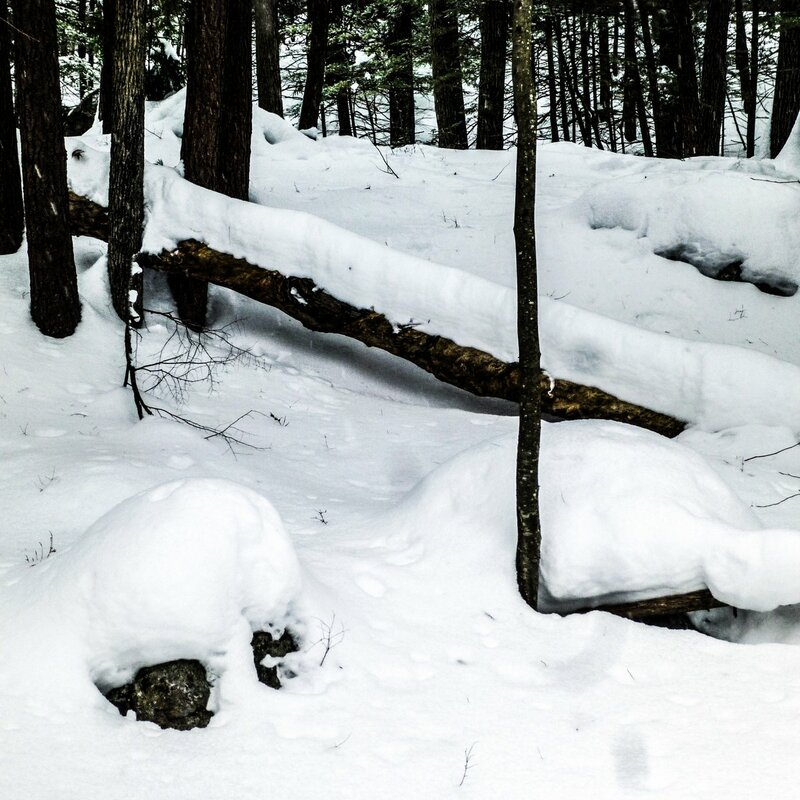 I noticed that people had broken a path through the snow at a local forest that I visit often, so I decided to follow it one cold and cloudy day. The snow was well packed and easy to walk on and squeaked under my boots. 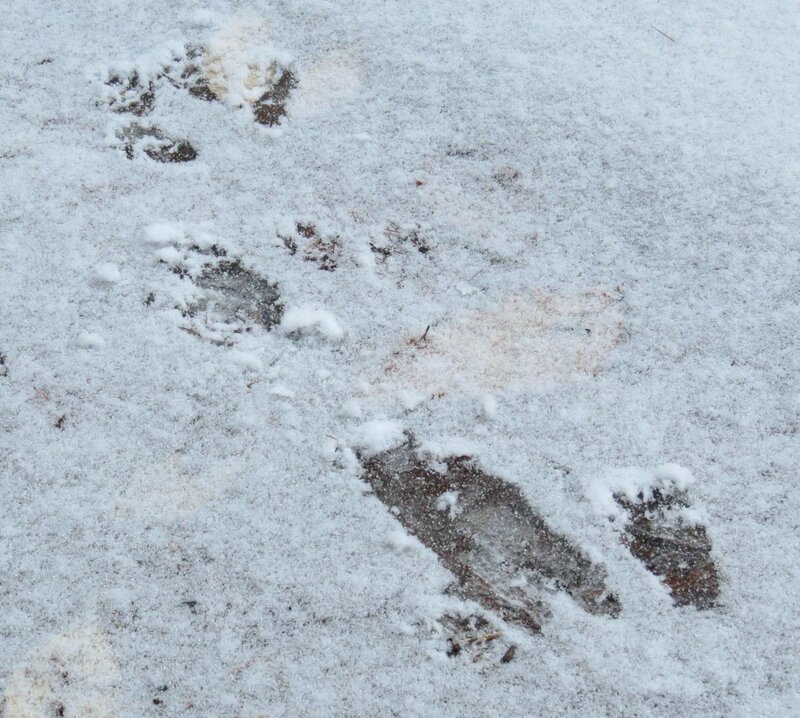 For those of you who have never experienced real cold; when it’s really cold the snow squeaks when it’s walked on, and it does that so nature nuts know that it’s too cold to be out walking on it. At least, that’s my theory. 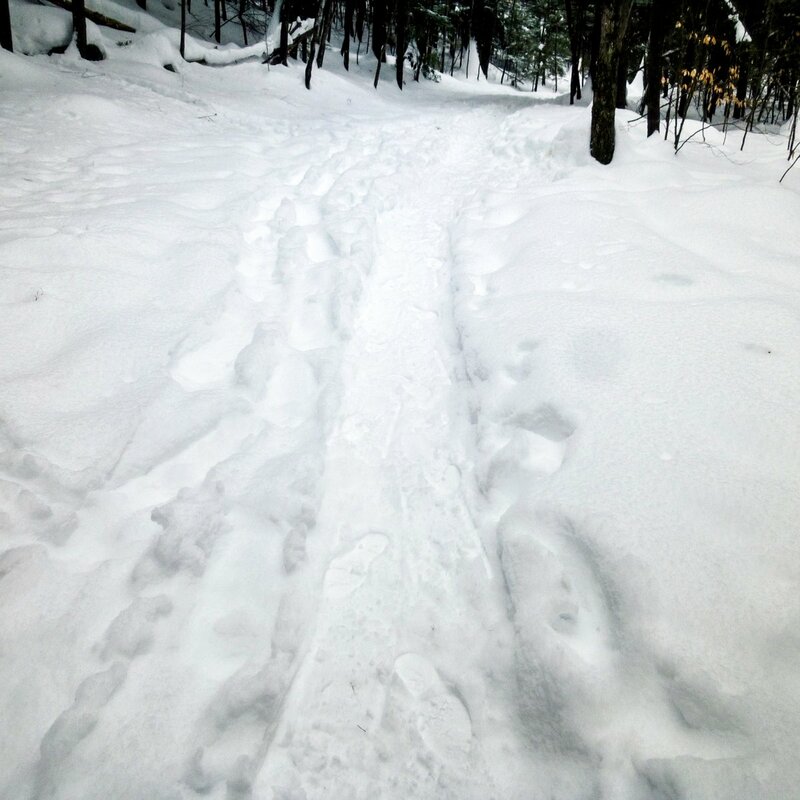 The path was also only 1 person wide and if you stepped off it into the soft snow at the sides you found yourself up to your knees in it. I suspected that would be the case so I thought ahead for a change and wore my knee high gaiters. I seem to be having some hip trouble so snowshoes aren’t a good idea right now. 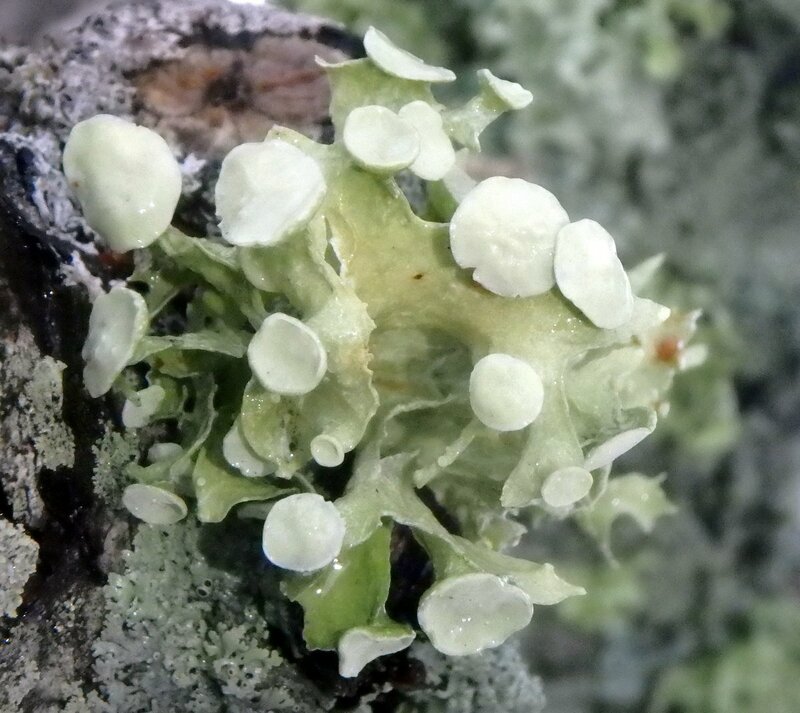 With the gaiters on I was able to plow through the snow without getting soaked below the knees and boots full of snow, so I could get a look at things like this green shield lichen (Flavoparmelia caperata.) 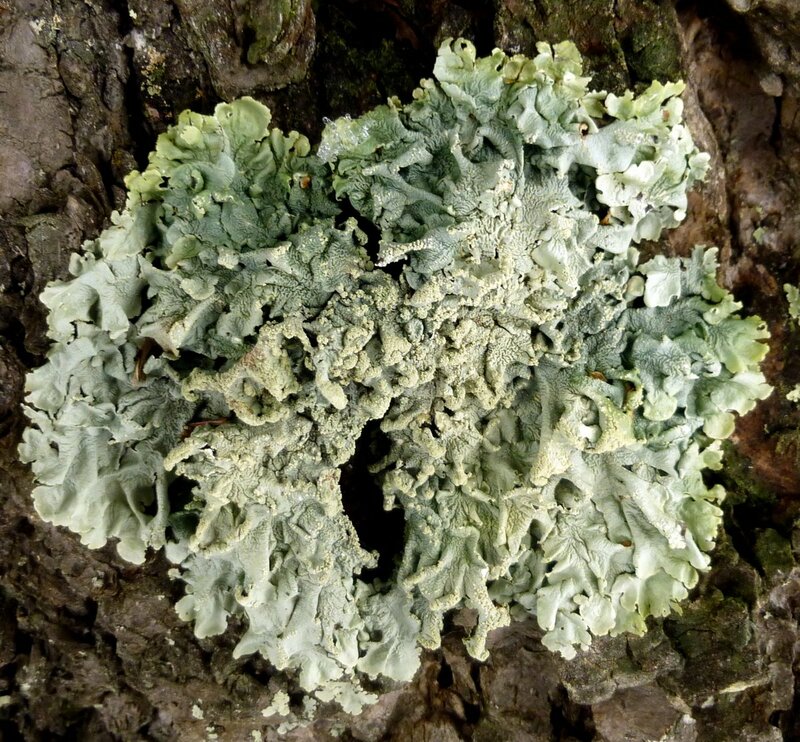 It’s not hard to see how it came by its common name; it looks just like a shield. 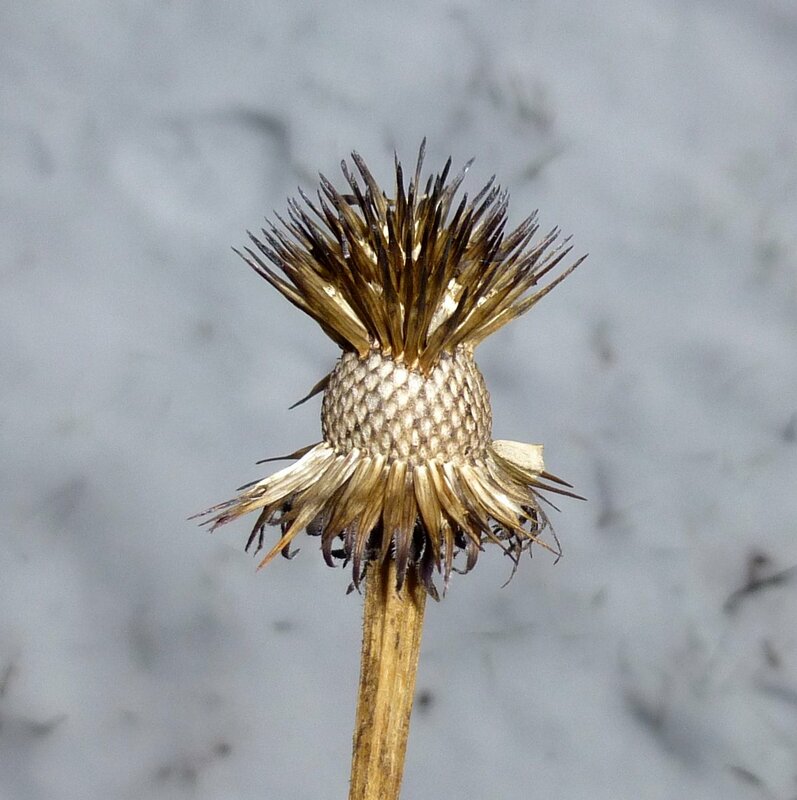 Its dryness reminded me that winter can be as dry as a desert, in spite of all the snow. 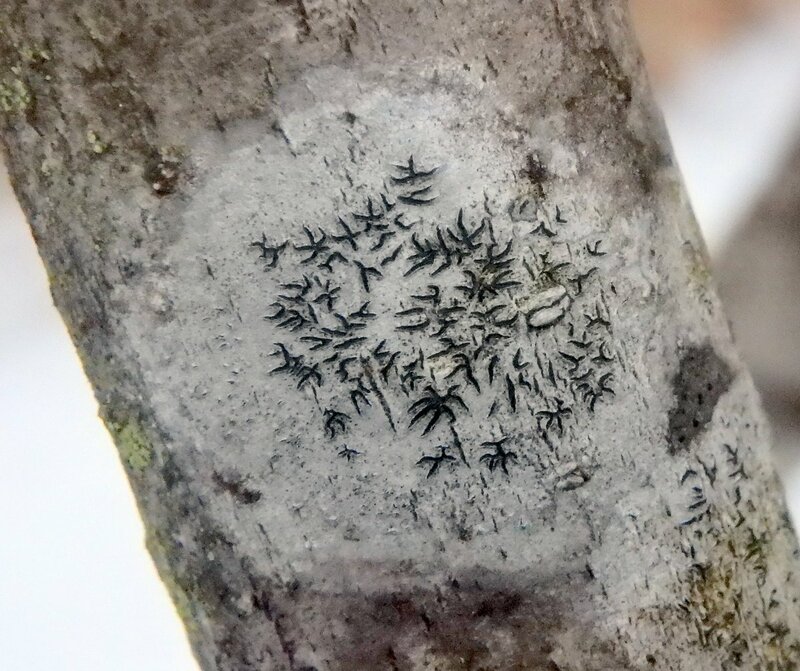 One of the best things about walking through the woods in winter is seeing those things which we ordinarily wouldn’t see or which wouldn’t register, like moss on a tree trunk. 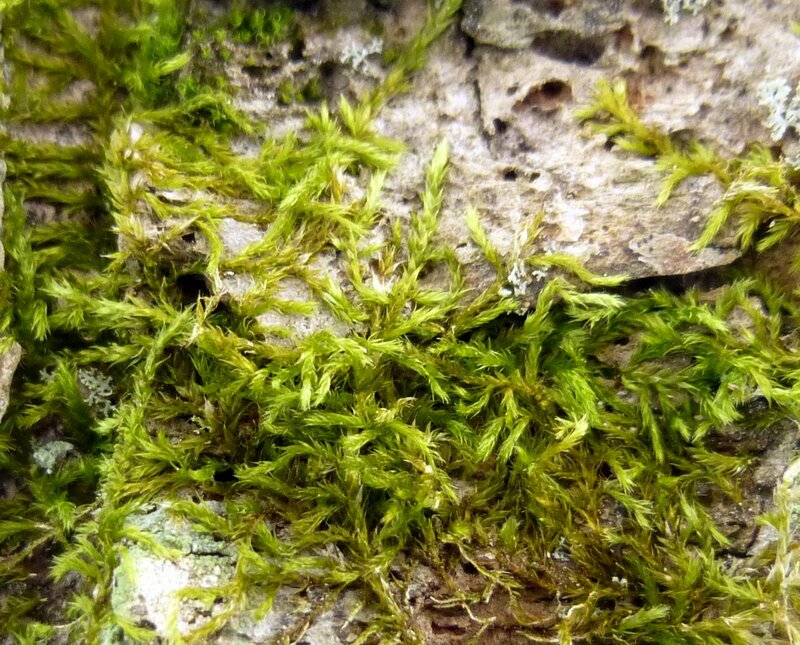 At other times of the year there is so much to see that most of us would pass a small bit of moss by without a second glance. But if we did we’d probably be missing something beautiful and fascinating, like this stalked feather moss (Brachythecium rutabulum.) 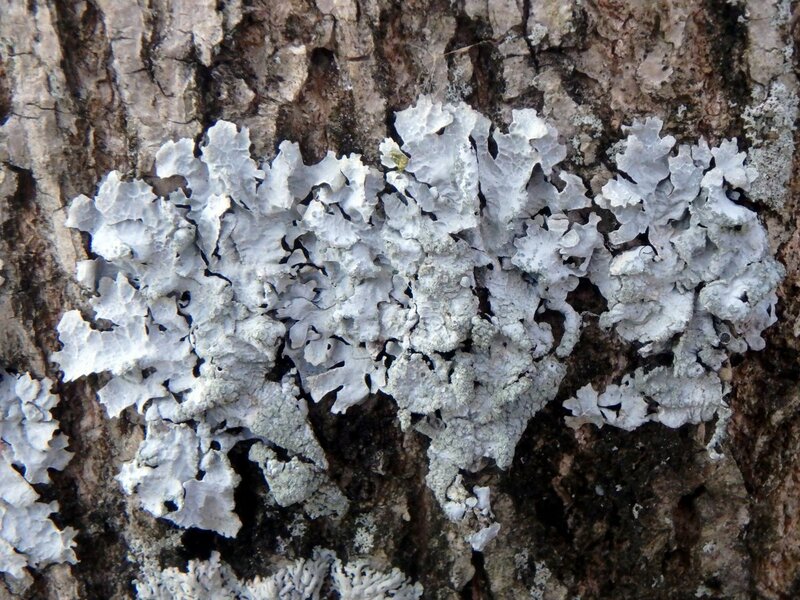 Though it doesn’t seem to be moving we know that it is because we can read its movements and easily see how it has crawled up and over the bark plates looking for that perfect spot where it will get all the sunshine, water and nutrients that it needs. It seems to pulse with energy and you can sense how full of life it is. 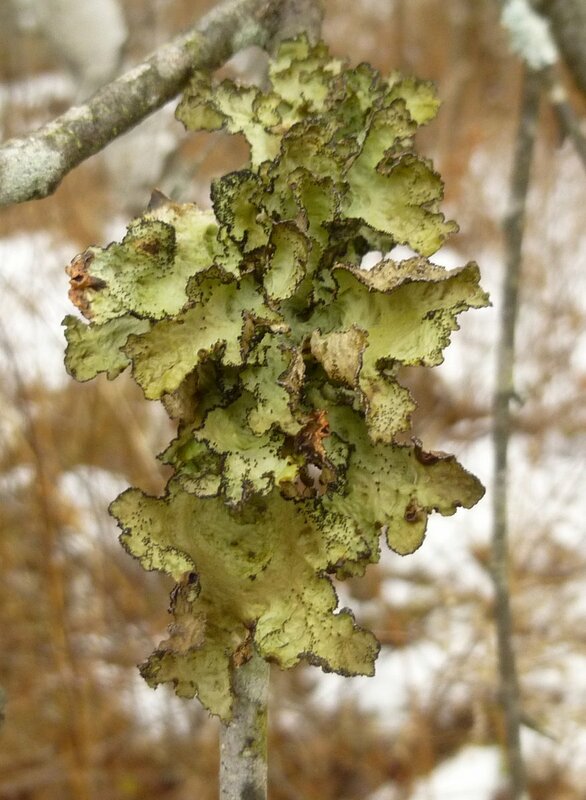 Its beautiful green color offers a welcome contrast to the brown, black and white winter landscape. 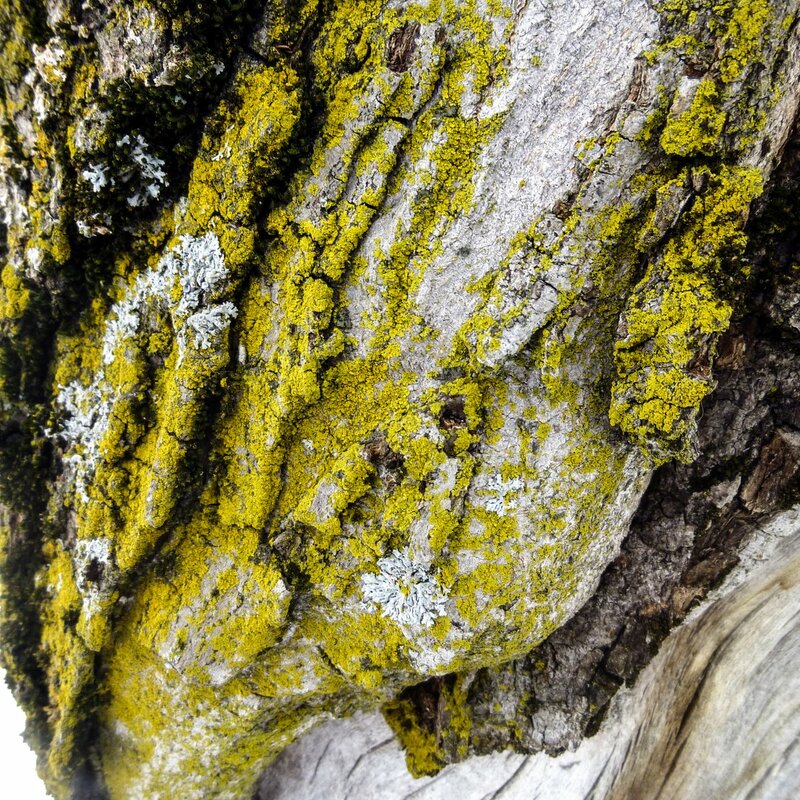 You don’t always have to see something on the bark of a tree though, because often the bark itself is every bit as interesting and beautiful as anything that might grow on it. 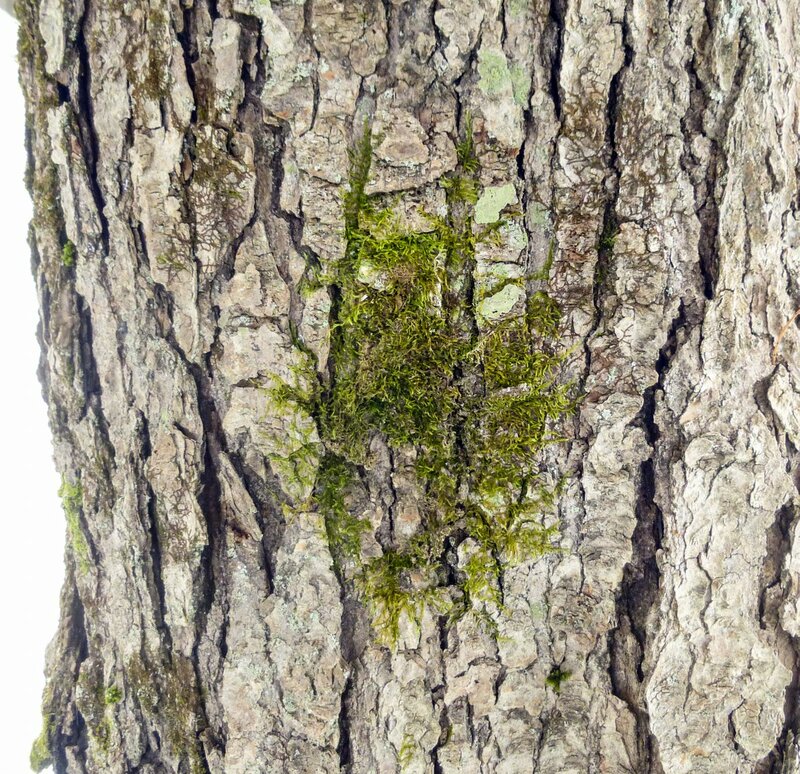 As I took off my glove and ran my hand over the beautiful, deeply furrowed bark of this old northern red oak I imagined that I knew how Adam must have felt when he first laid eyes on the garden. Surely the love of creation must have welled up inside of him like a spring bubbling up from the earth. The woods might seem hushed and quiet but if you stop and listen you’ll find that spring is in the air. 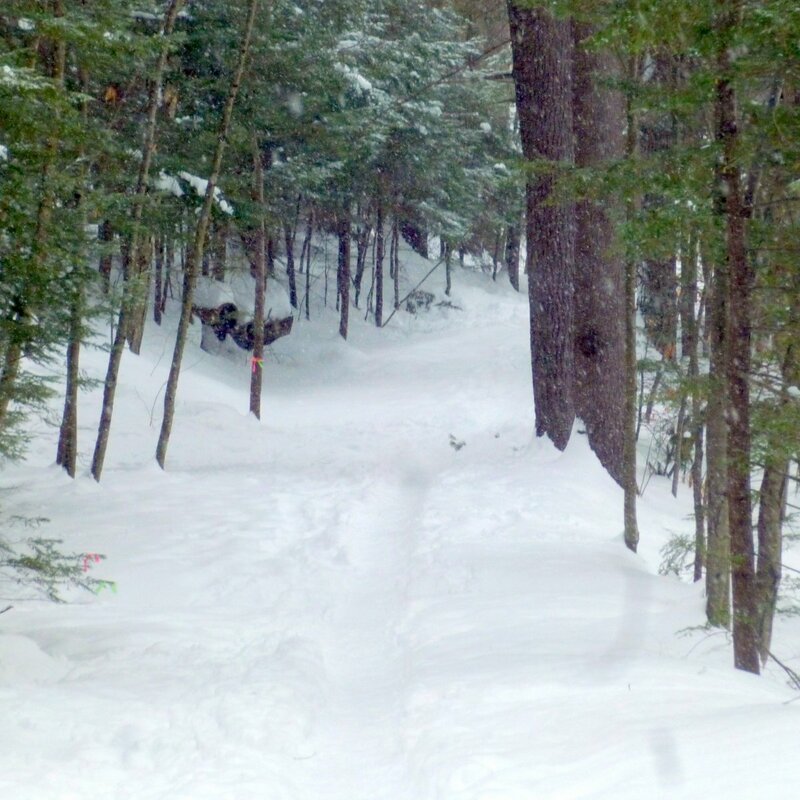 When I stopped squeaking the snow I heard a bird singing a beautiful song just above me in the treetops. I couldn’t see it so I don’t know which bird it was but it wasn’t one of the common, often heard songs. In fact I can’t remember ever hearing it before, but I’d love to hear it again. The trees will tell you which way the wind blew during the last storm. 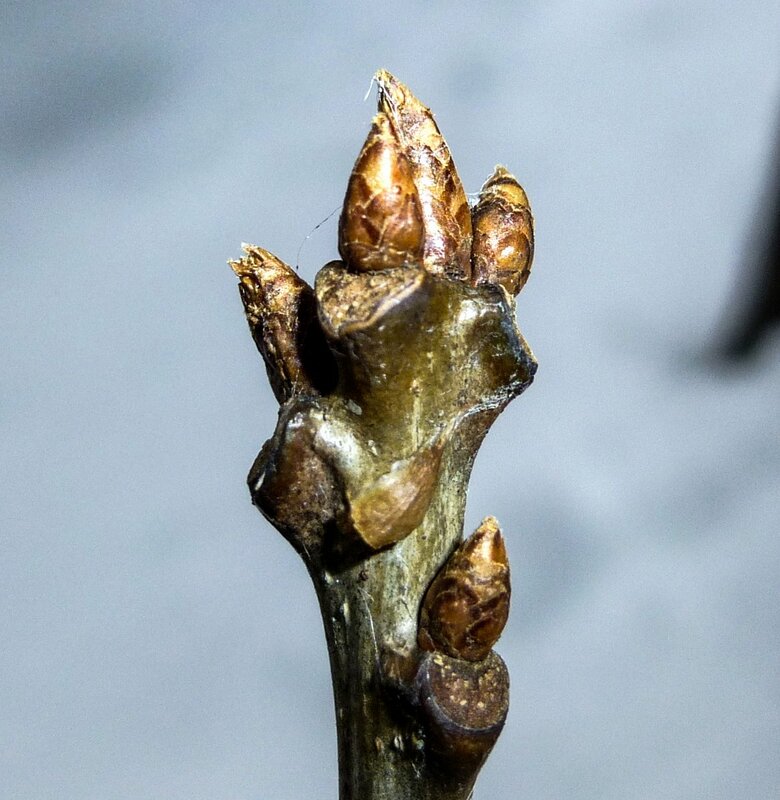 There are many northern red oaks (Quercus rubra) in these woods and I stopped to admire the buds of another one. 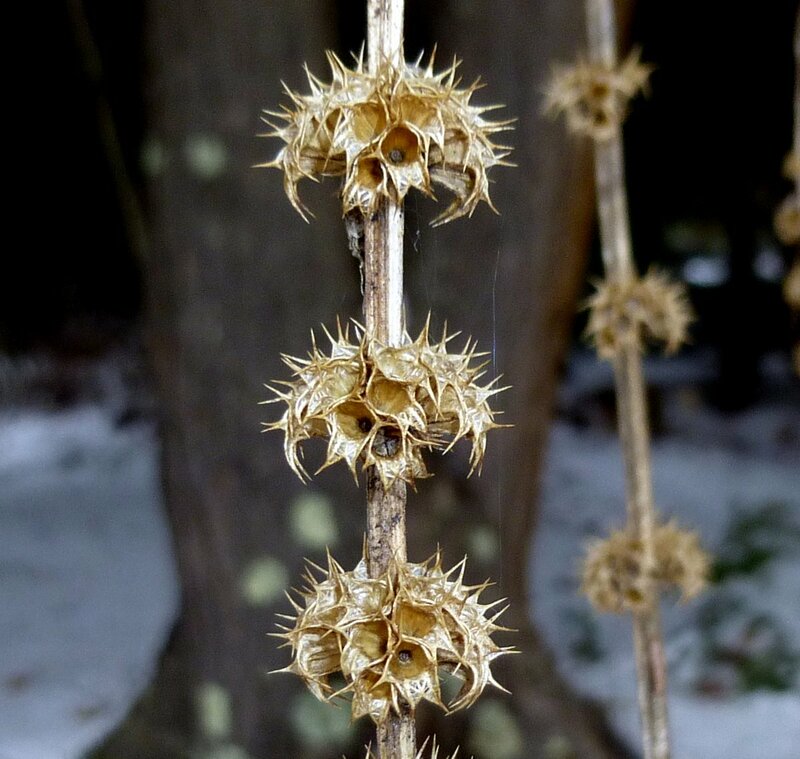 We have a lot of white oak (Quercus albra) as well but their buds aren’t as sharply pointed as these. There was no sign of these swelling just yet. 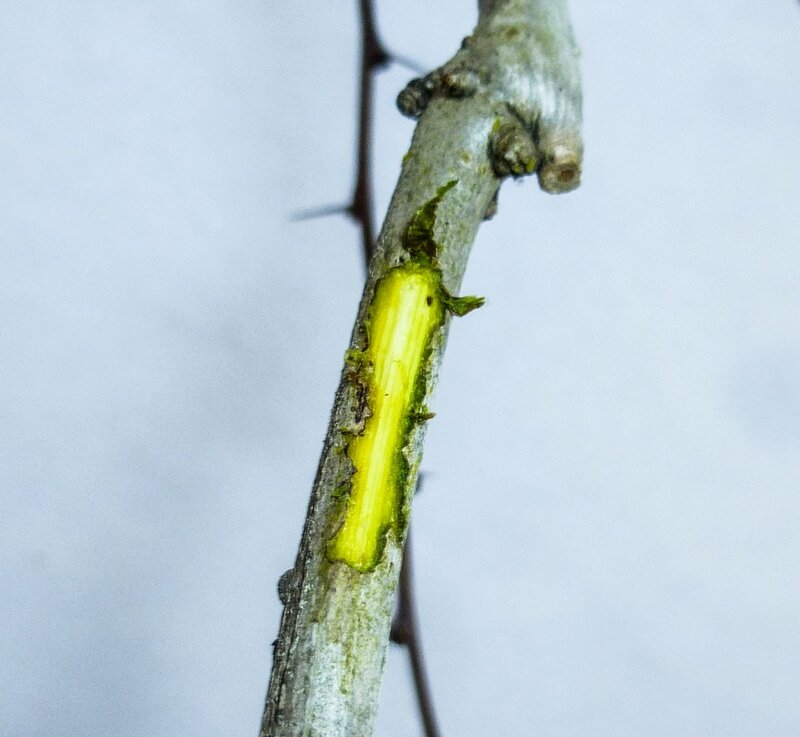 Sugar maple buds look very similar to red oak buds because of the overlapping bud scales but an easy way to tell the two apart is by their branching habits. Oaks like the one in the photo have alternate branching and maples have opposite branching. 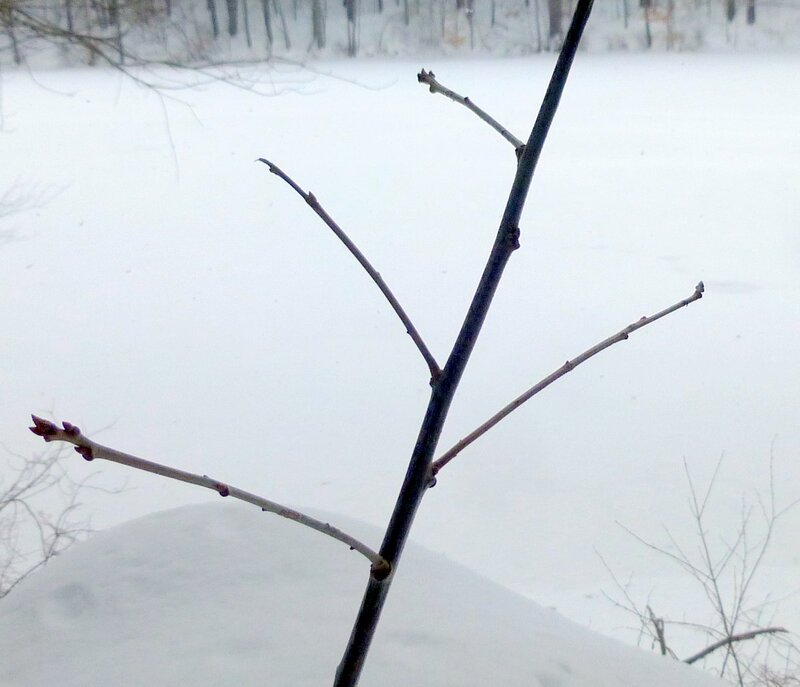 If you’d like to be able to identify trees in winter studying their branch structure and winter buds is a great place to start. 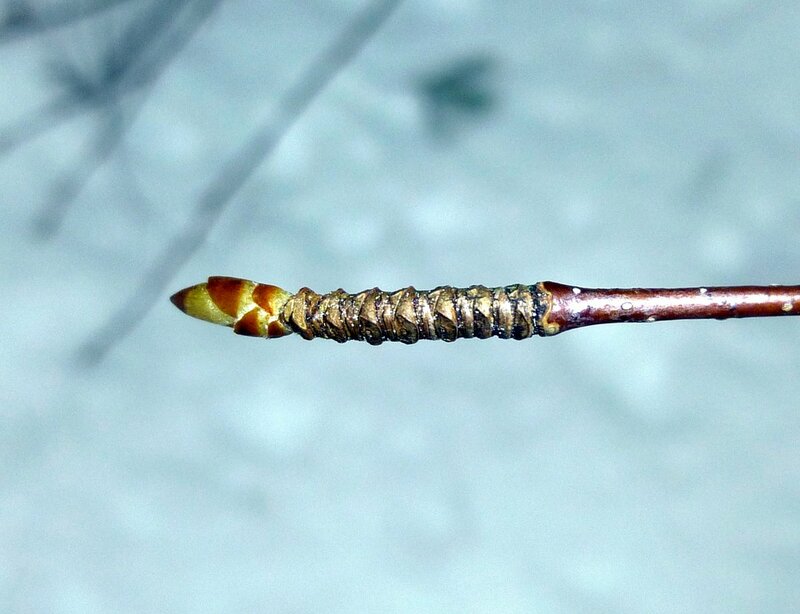 This bud had me scratching my head for quite a while but the taste test finally told me that it was a black birch (Betula lenta.) Black birch looks so much like cherry that another common name for it is cherry birch, but this bud didn’t look anything like a cherry bud. 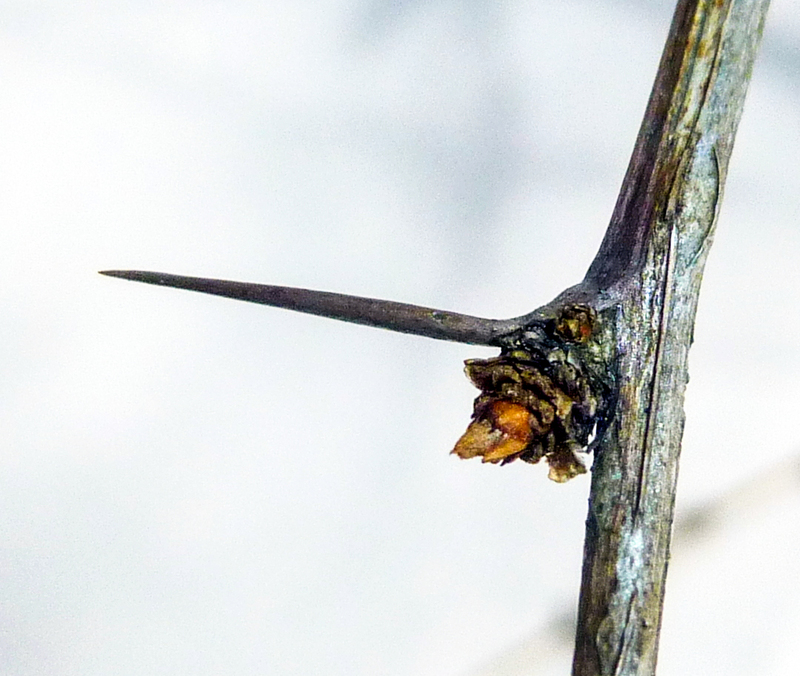 Actually, it looks a lot like a buckthorn bud but that’s a shrub, not a tree. 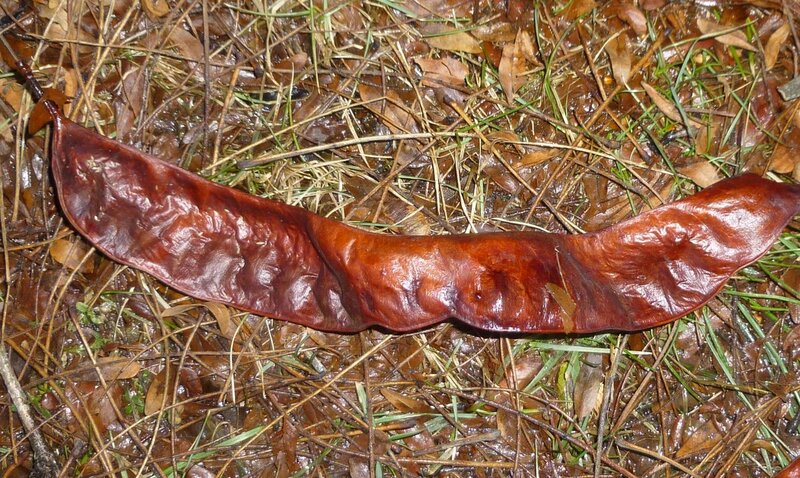 Chewing a twig revealed a taste of wintergreen and told me immediately what it was. 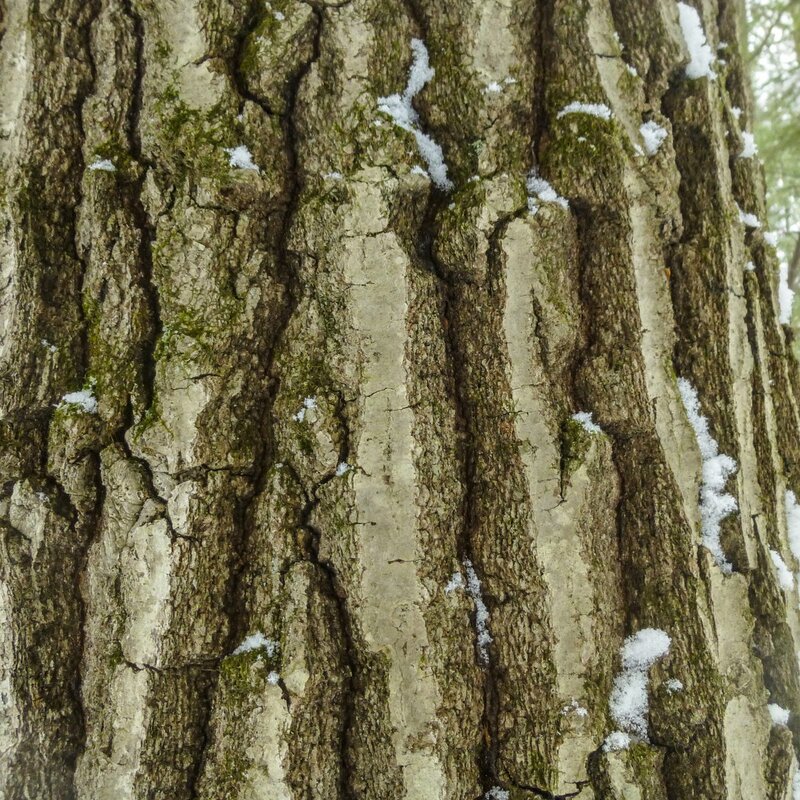 Black birch often fools me because so many were harvested to make oil of wintergreen that I rarely see them unless I go to spots where I know they grow. Now I know another spot. 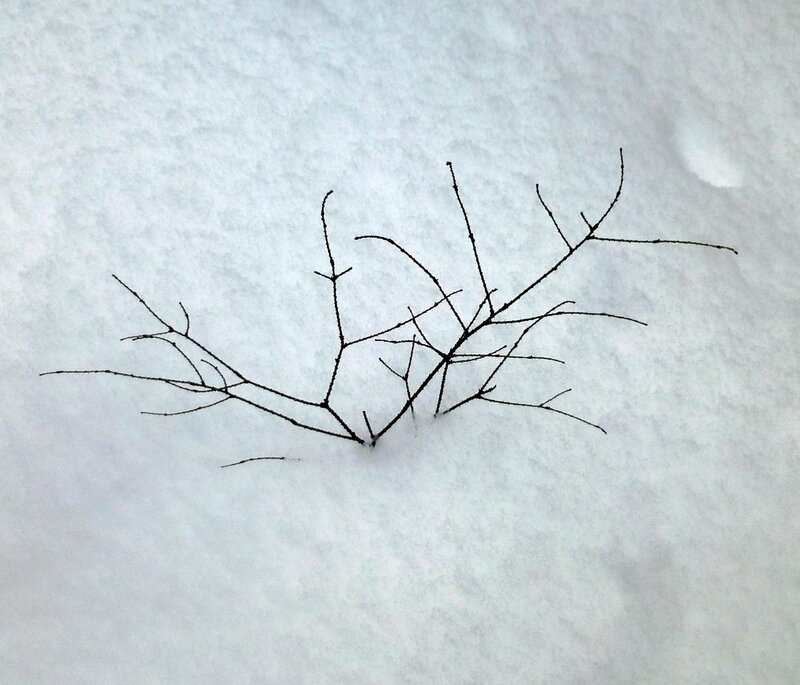 Eastern hemlock branches aren’t hard to identify; I’ve raked up millions of them. 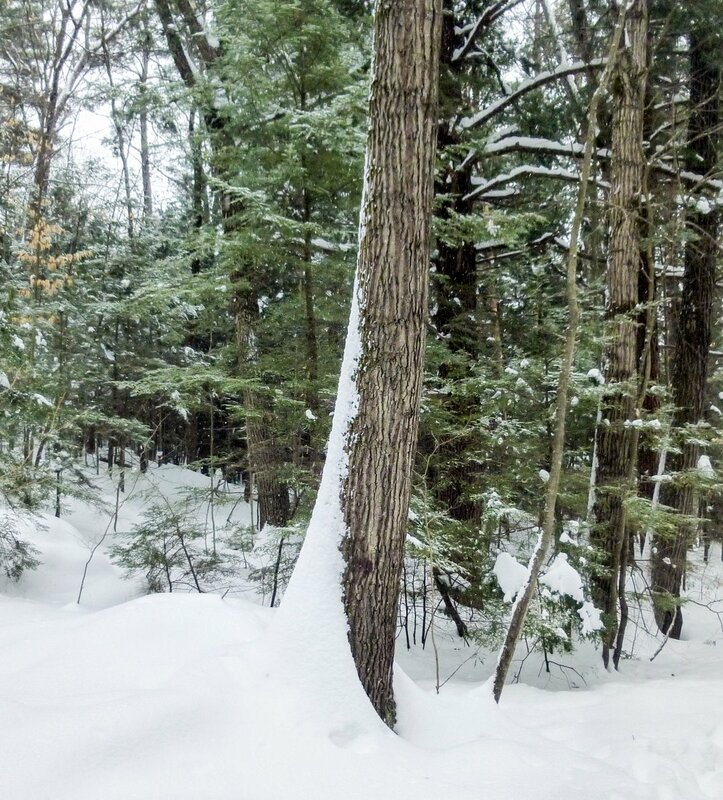 Hemlocks, much like weeping willows, are a “self-pruning” tree and can be quite messy. 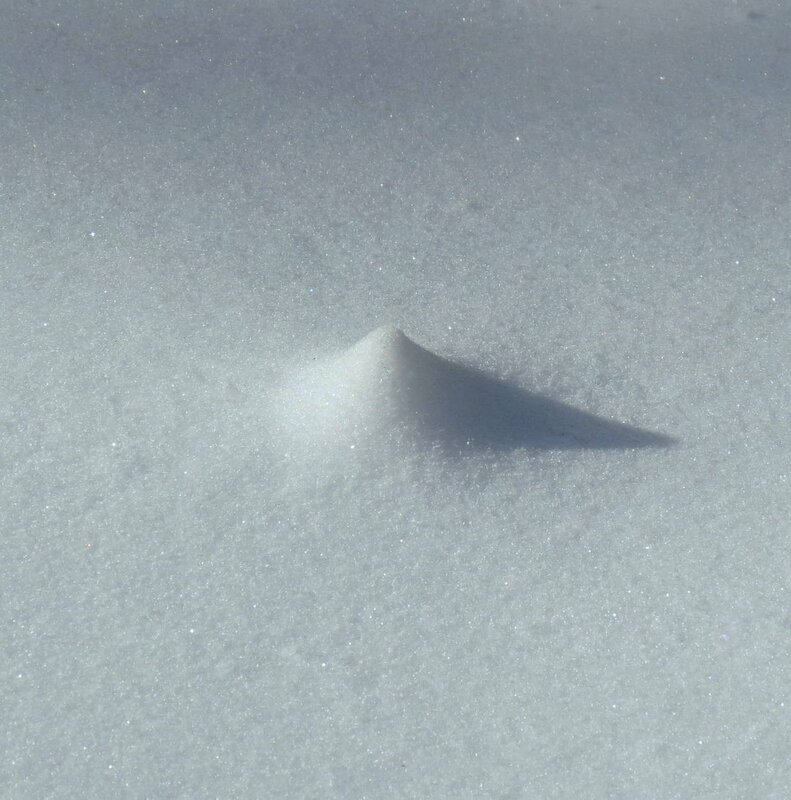 The snow in this photo seems to have a strange, luminous quality that I don’t remember seeing in person. 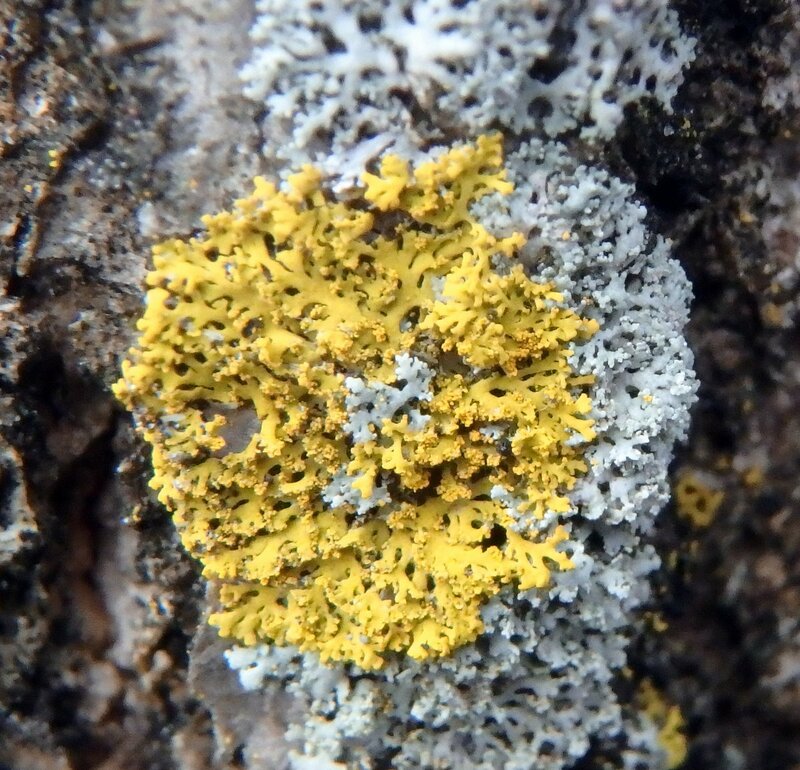 The yellow inner bark will tell you that you’re seeing a barberry…. 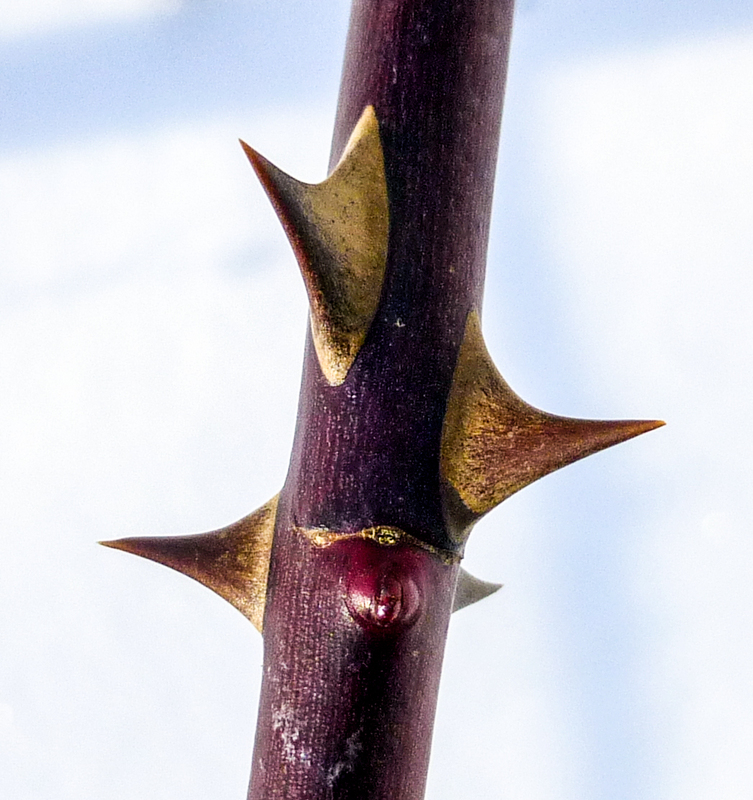 But in the winter it’s the thorns that will tell you which one. European barberry (Berberis vulgaris) and American barberry (Berberis canadensis) both have clusters of 3 or more thorns but since American barberry doesn’t grow in New England it comes down to European or Japanese, and only the very invasive Japanese barberry (Berberis thunbergii) has single thorns. I don’t think I’ve ever seen it snow when the sun was shining as much as I have this year. 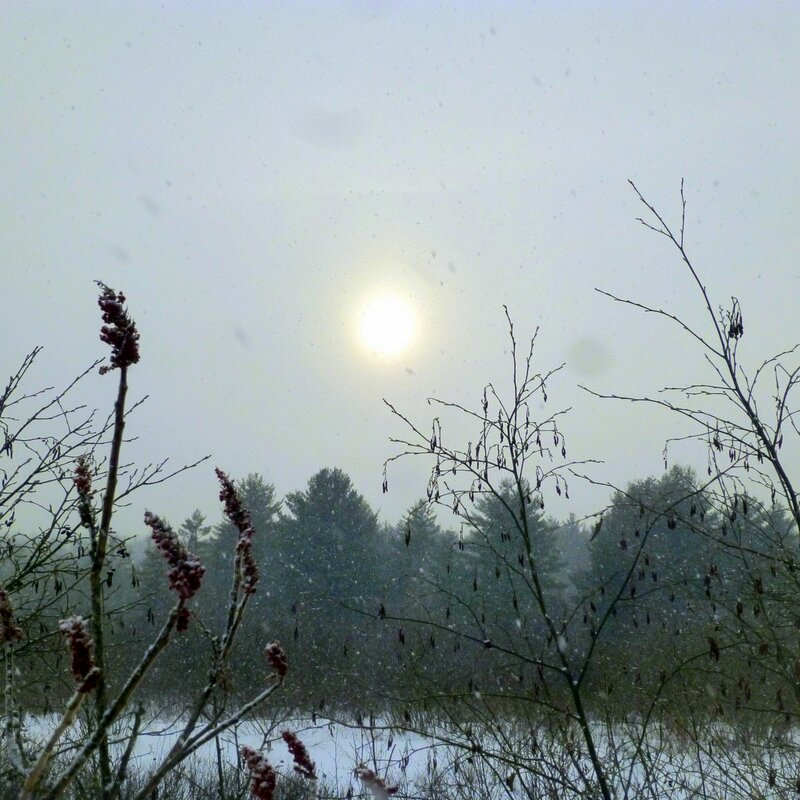 It’s as if the atmosphere is so full of snow that it can’t even wait for the sun to stop shining before it drops more of it, and what looks like spots and smudges on this photo are just that-more of it. 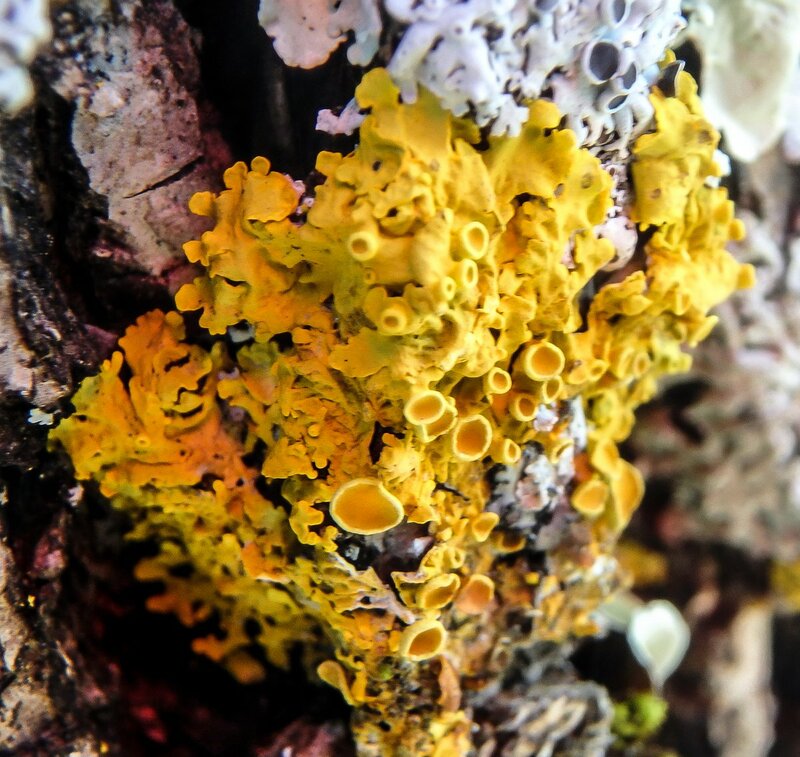 I’m forever telling people that they don’t really have to go anywhere to see nature because it’s all around them, so I thought I’d take a wander around town just to see if I knew what I was talking about. 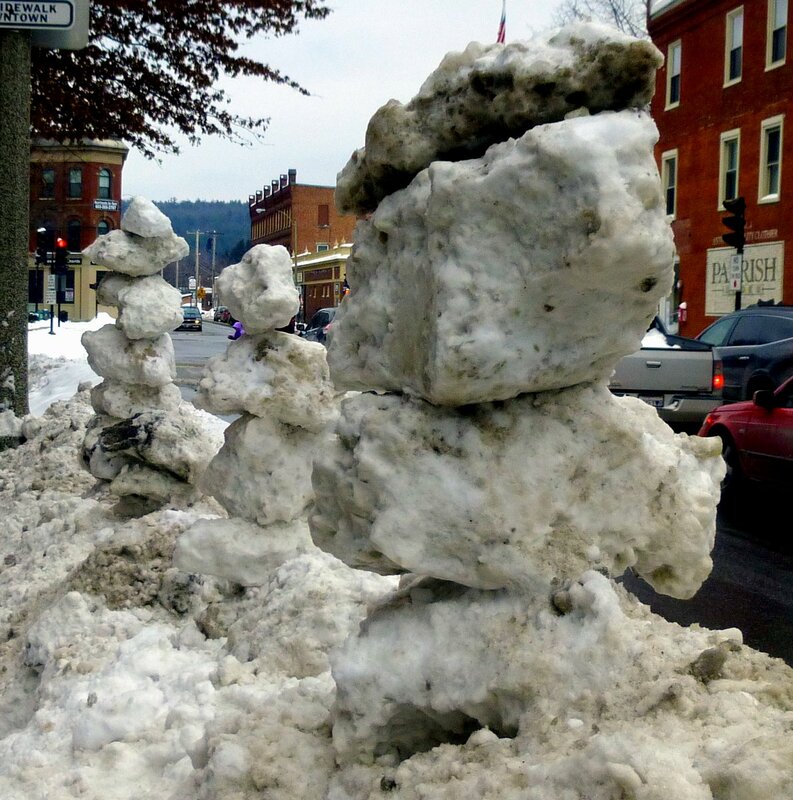 Another reason I went to town was because the sidewalks were plowed and I didn’t have to wade through knee deep snow. 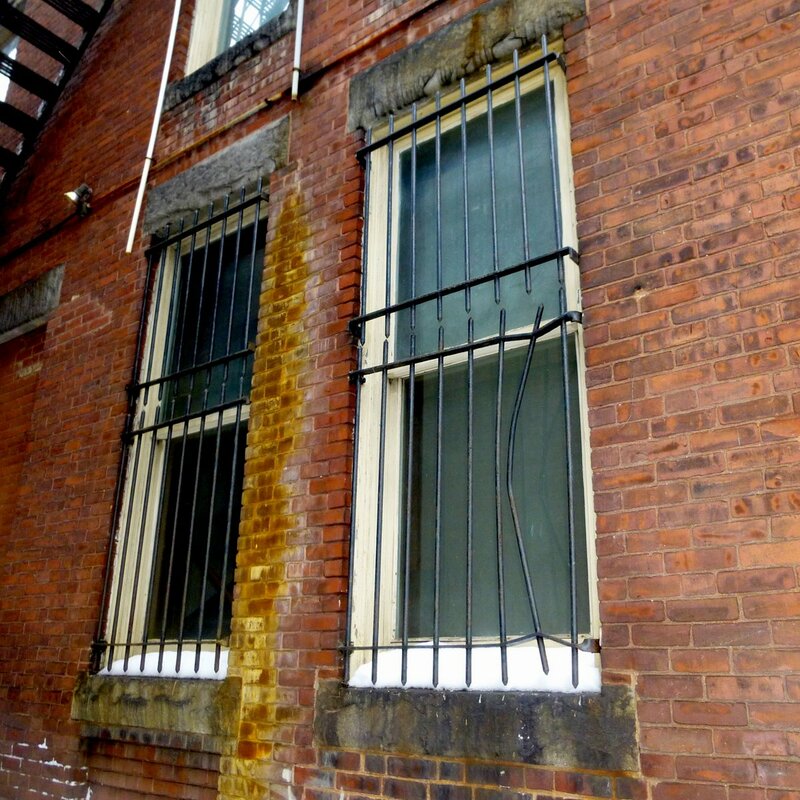 I started out at these barred windows because somebody used to grow beautiful heavenly blue morning glories on the bars and I always thought it would make a great photo. Unfortunately when I finally got a decent camera they stopped growing the morning glories. The windows are barred because this used to be a bank and now is a jewelry store. I wonder if the bent bar means someone tried to get in, or out? I also wonder who could be strong enough to do such a thing. 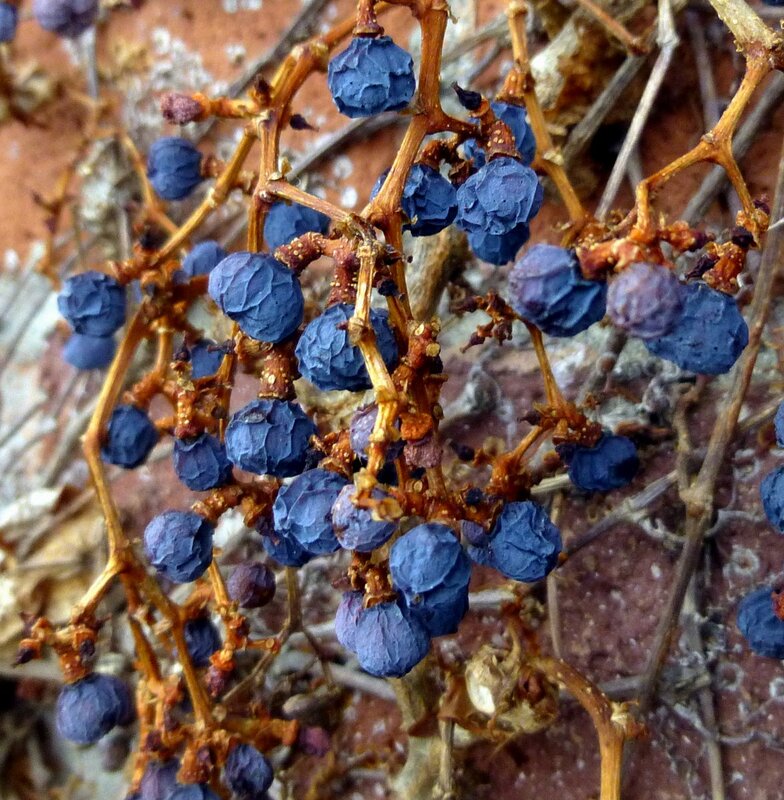 Since I can’t see morning glories I’ll just have to settle for the beautiful cornflower blue of Boston ivy berries. We have a lot of brick buildings here in Keene and Boston ivy (Parthenocissus tricuspidata) grows well on them. As I usually do when I talk about Boston ivy, I should say that it isn’t from Boston and isn’t an ivy. It is in the grape family and comes from eastern Asia. In the fall its red leaves are one of the most beautiful things in town but since the vines grow mostly on the rear of buildings few notice them. 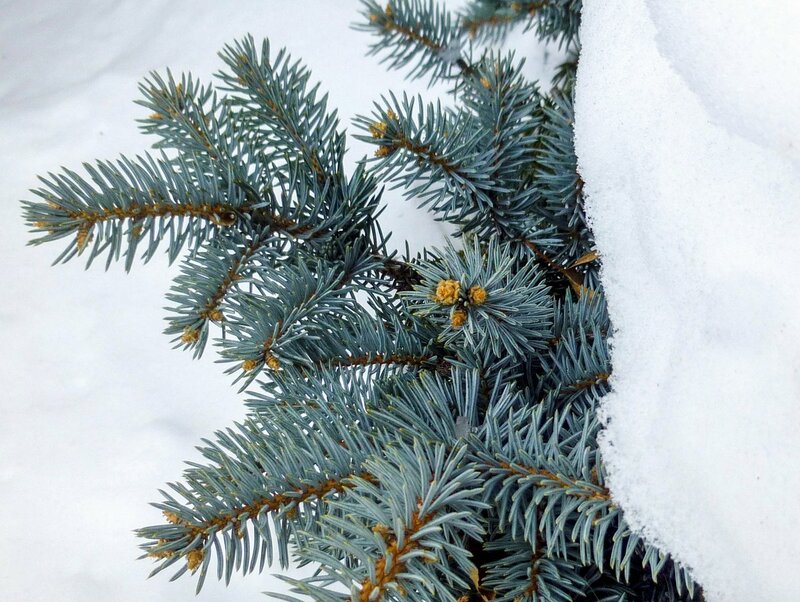 A Colorado blue spruce poked its colorful branches out of the deep snow. Snow won’t hurt this tree any; it was found growing on Pike’s Peak in 1862 up in the high country, so it’s perfectly cold hardy. Its silvery blue color comes from the waxy coating on its needles, which is similar to the bloom on blueberries and plums. 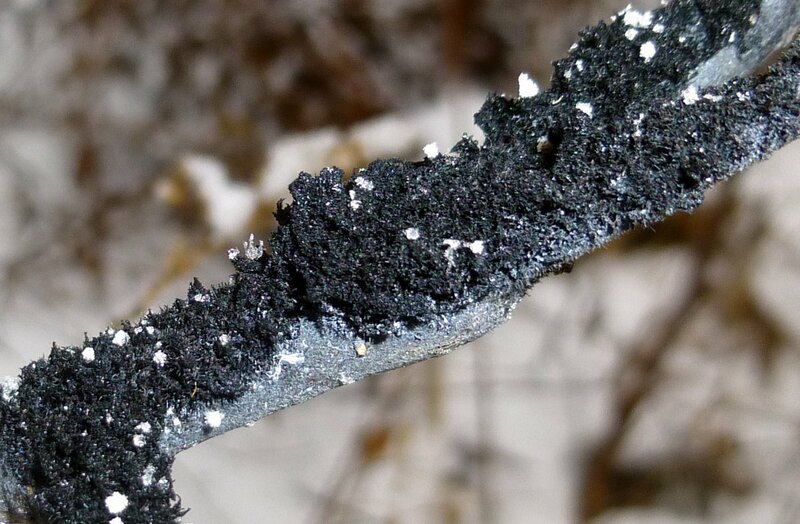 This coating helps its needles (actually leaves) to minimize moisture loss in winter when there is little water available to its roots. 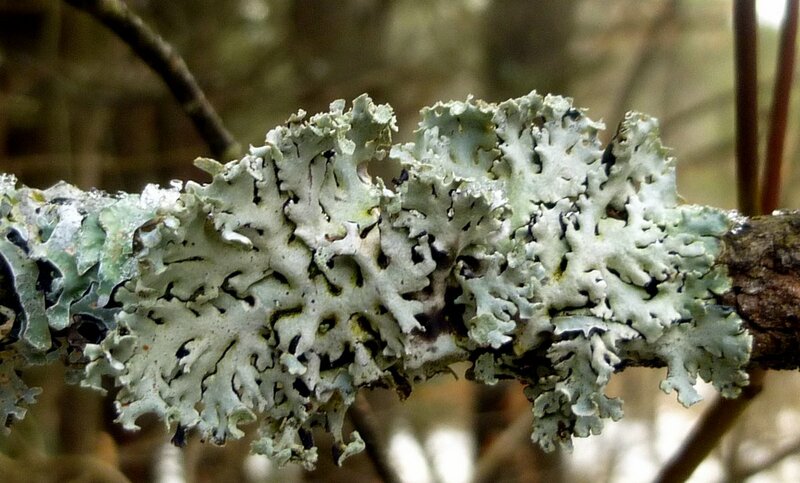 Some western Native American tribes used the tree medicinally to treat colds and stomach ailments but today its value comes from its popularity as a landscape specimen. 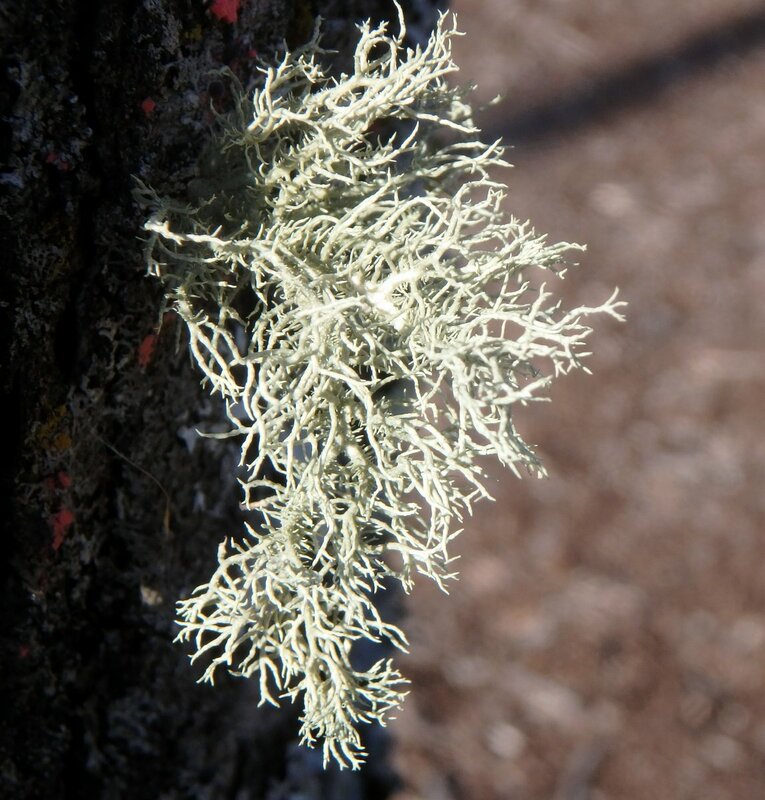 This crabapple tree was encrusted with what I believe is fringed candle flame lichen (Candelaria fibrosa.) 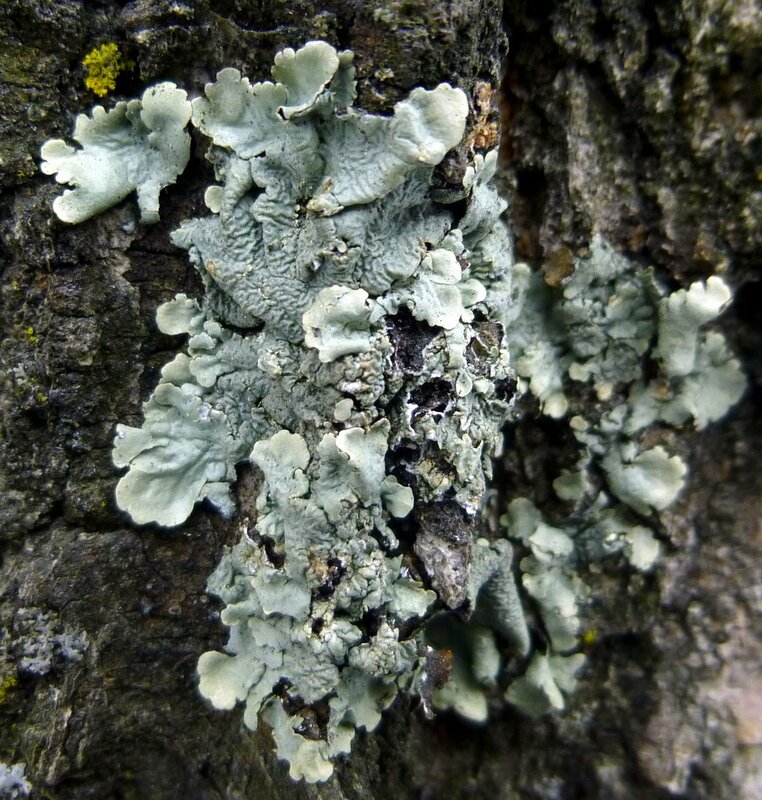 The city of Keene uses in-ground sprinklers in the summer and the spray keeps the trunks of these trees moist to about 5 feet off the ground and that’s just where these water loving lichens grow. 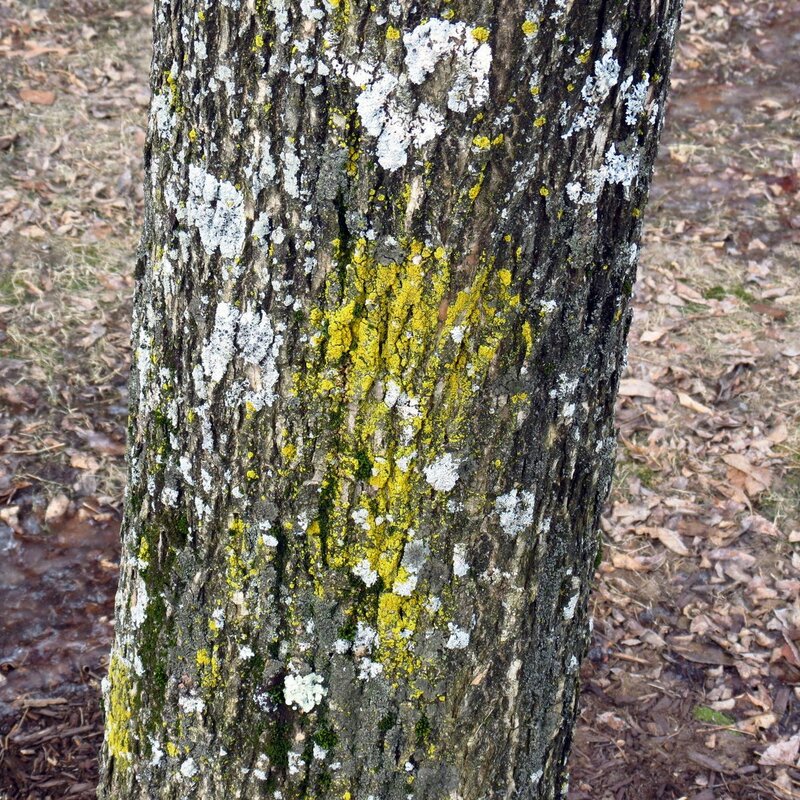 Some trees are so covered with them that it looks as if someone painted them bright yellow. 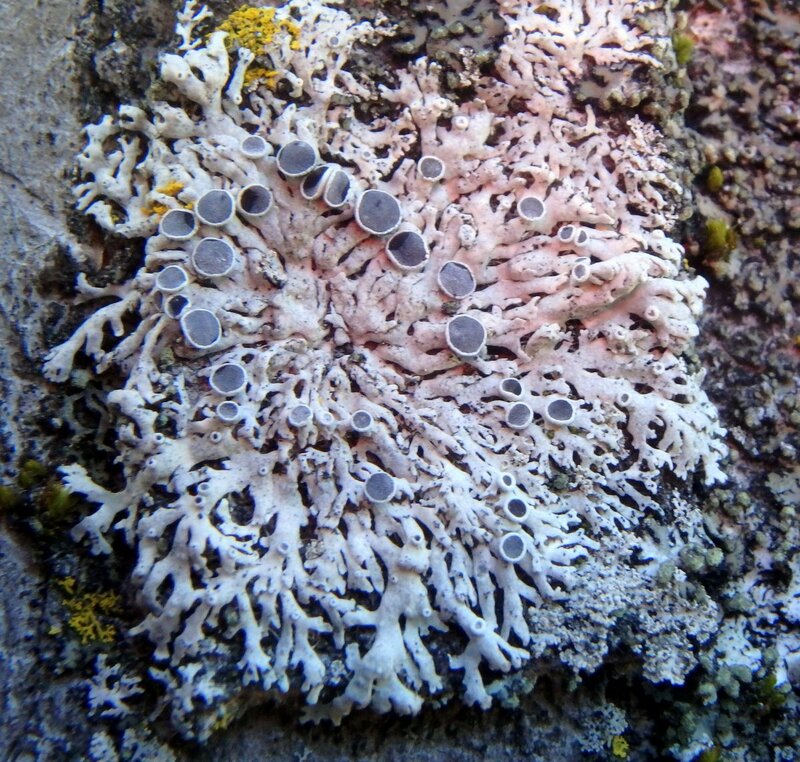 My book Lichens of North America says that fruiting bodies (Apothecia) are commonly seen on fringed candle flame lichens, but this is the first time I’ve seen them. They are the cup shaped parts, which were extremely small and difficult to get a good photo of. 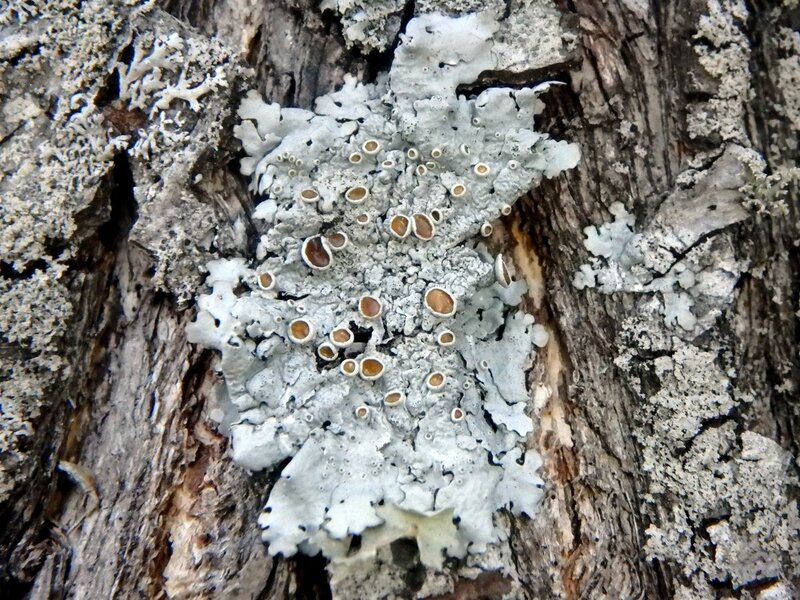 I think the largest one seen in this photo was probably only 1/16 of an inch across. 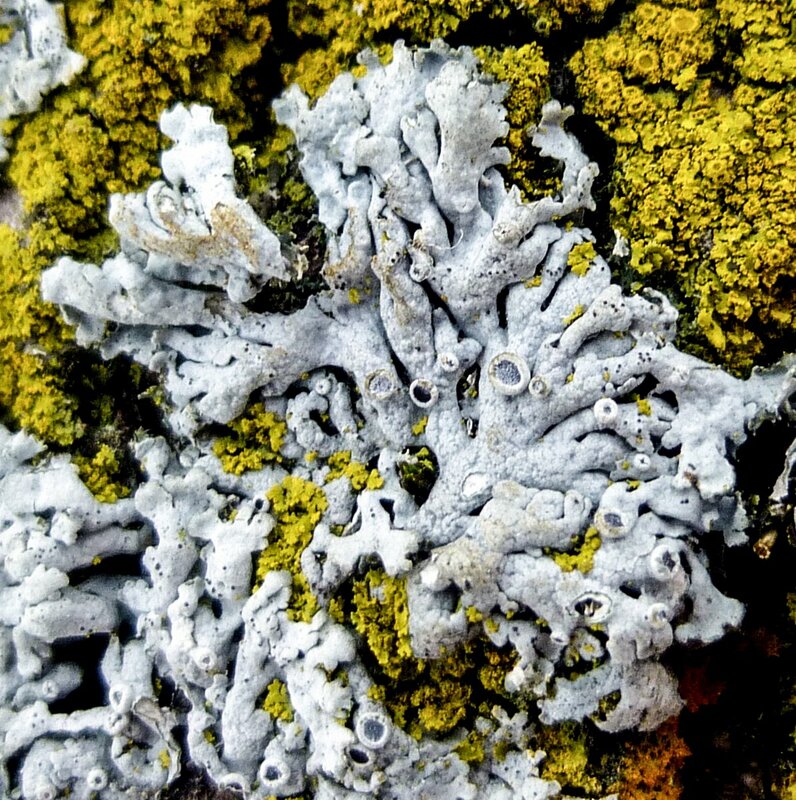 This lichen is said to be very sensitive to air pollution, so seeing it is a good sign that our air quality is good. 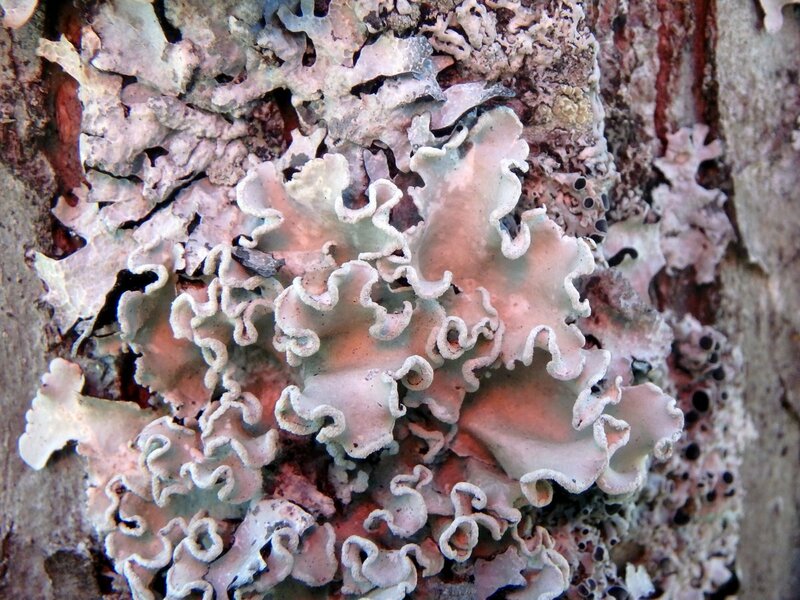 What I believe were star rosette lichens (Physcia stellaris) grew among the fringed candle flame lichens. 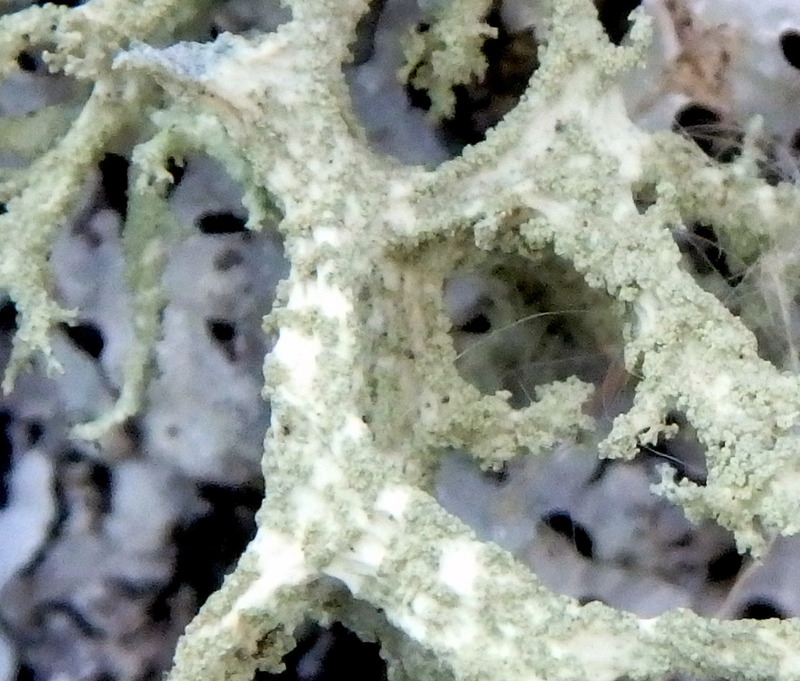 Star rosette lichen gets its common name from the way its lobes radiate outward like a star. 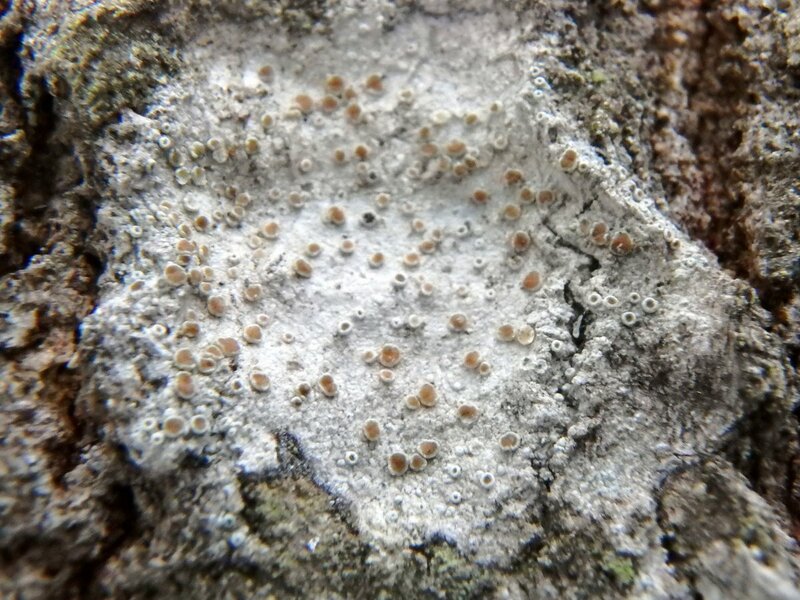 This photo doesn’t show that feature well though, because I was trying to get a shot of the Apothecia, which I’ve never seen on this lichen either. 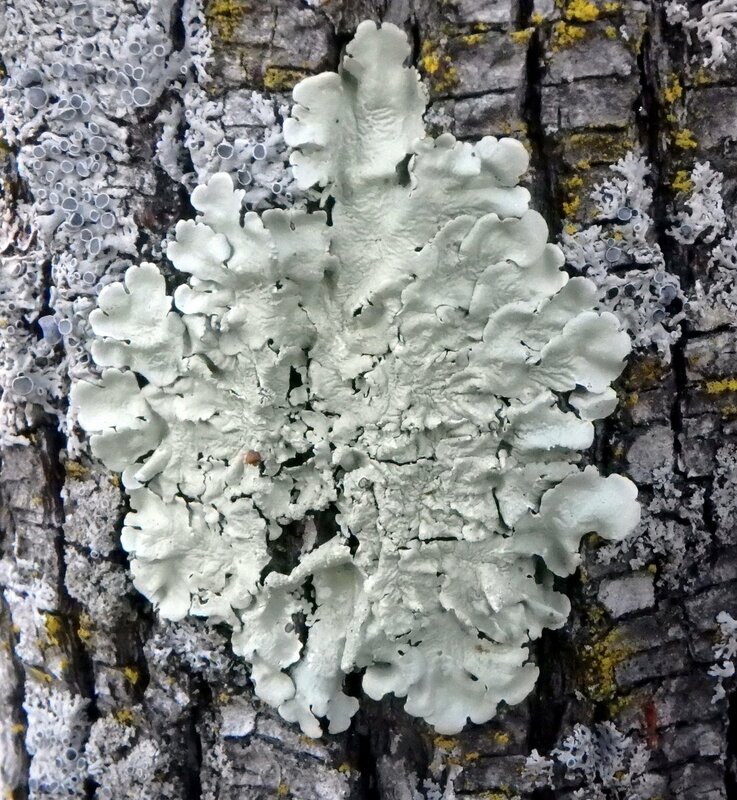 I was excited to see so many lichens fruiting, but it made me realize that the reason I haven’t seen them fruiting before was because I was looking at them in the summer. 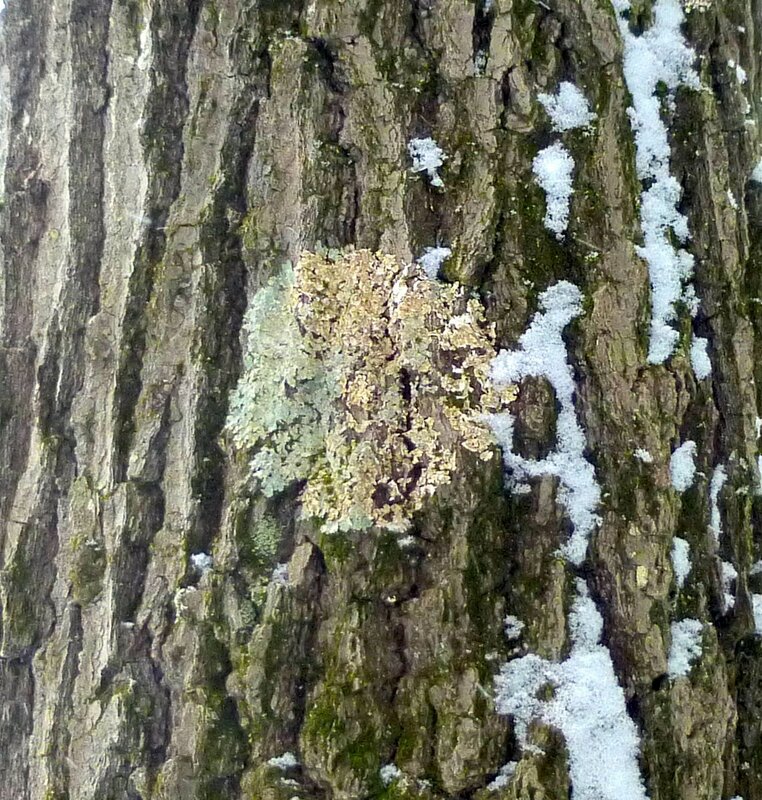 Does anyone know why so many lichens (and mosses) produce spores in winter? It seems an odd time for a plant to want to reproduce and I’m not sure what the advantages would be. 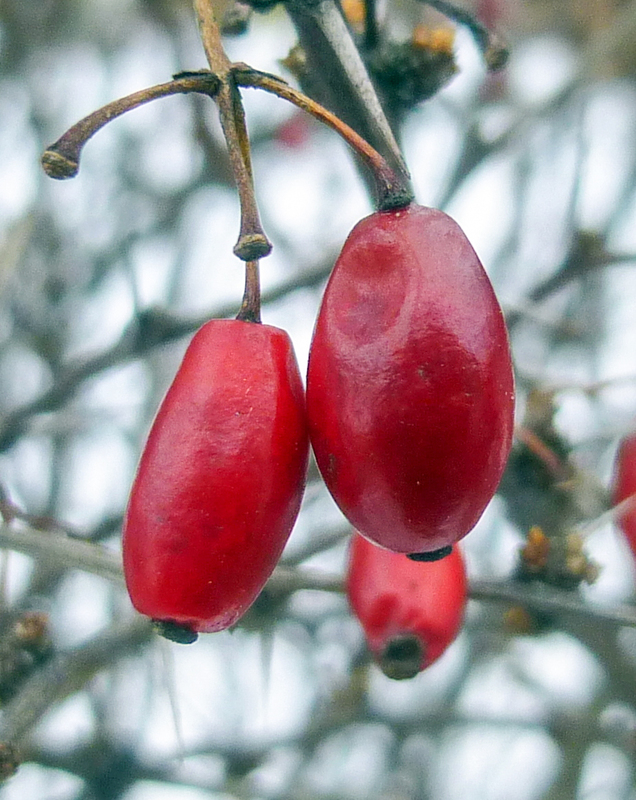 I’ve read that there are fruits, especially those that grow on imported plants, that birds will simply refuse to eat and apparently these crab apples are one of them. 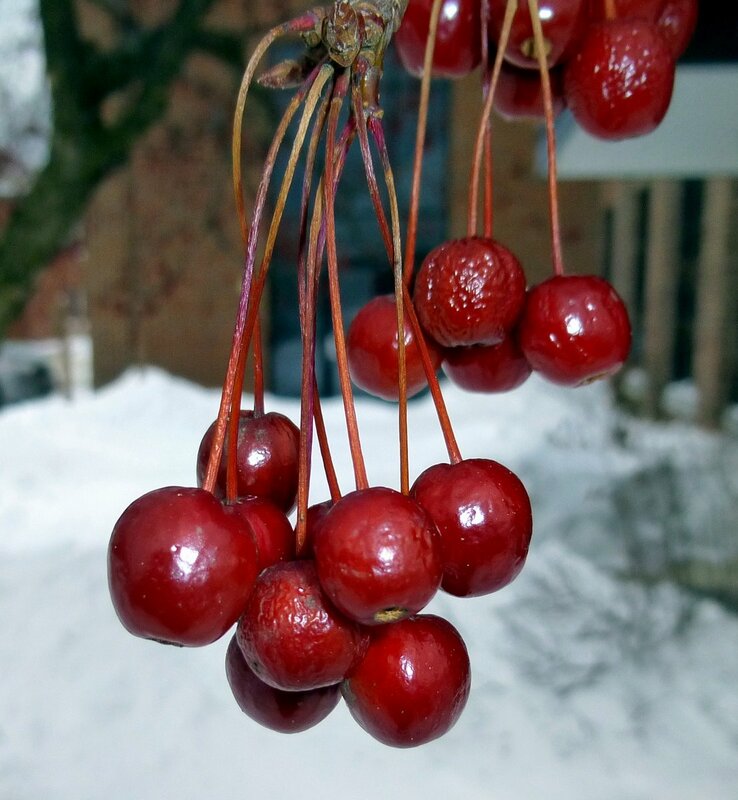 Birds won’t eat other crab apple varieties until they have frozen and thawed several times, but those pictured must have done that many times this cold winter. This tree was absolutely loaded with fruit and not a single piece had been eaten. It seems a shame that a more bird friendly variety couldn’t have been planted. 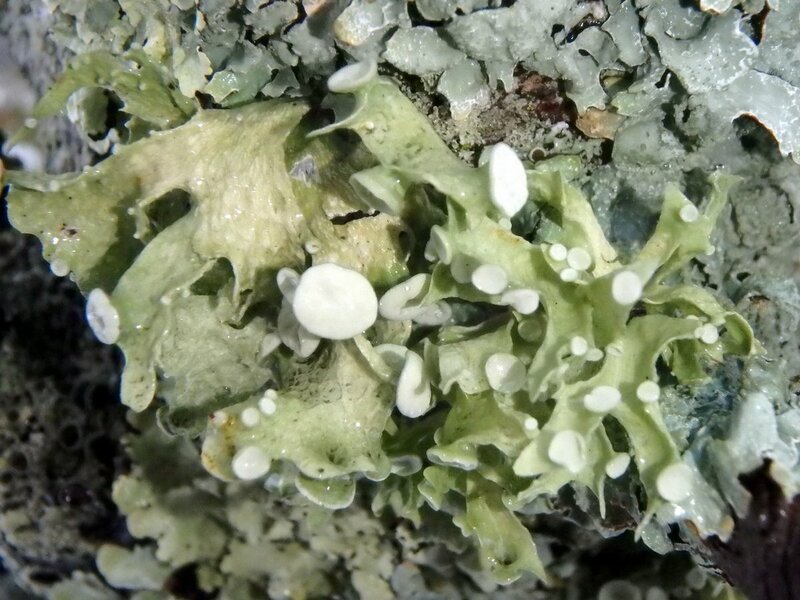 There are shield lichens, starburst lichens, candle wax lichens, and ruffle lichens and they all look very similar, but I think this one might be a common green shield lichen (Flavoparmelia caperata.) 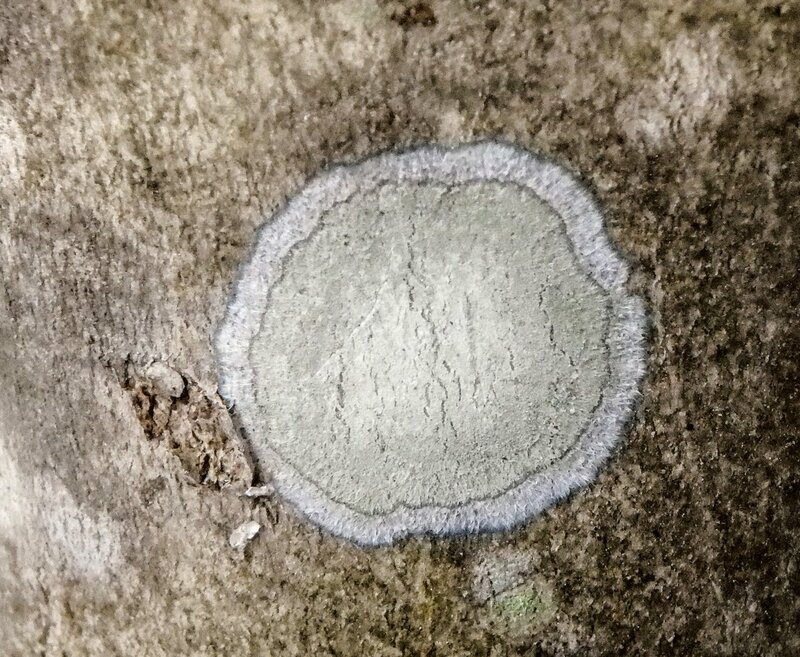 This is a good example of a lichen which can reproduce itself vegetatively; the granular looking bits toward its center are called soredia. 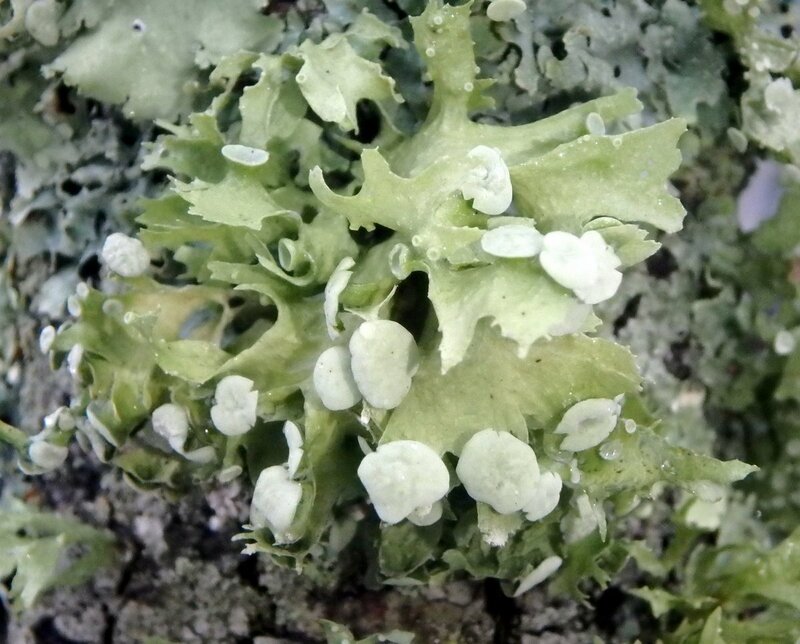 Soredia are meant to fall off and start new lichens, and many lichens use this method of reproduction in addition to producing spores. 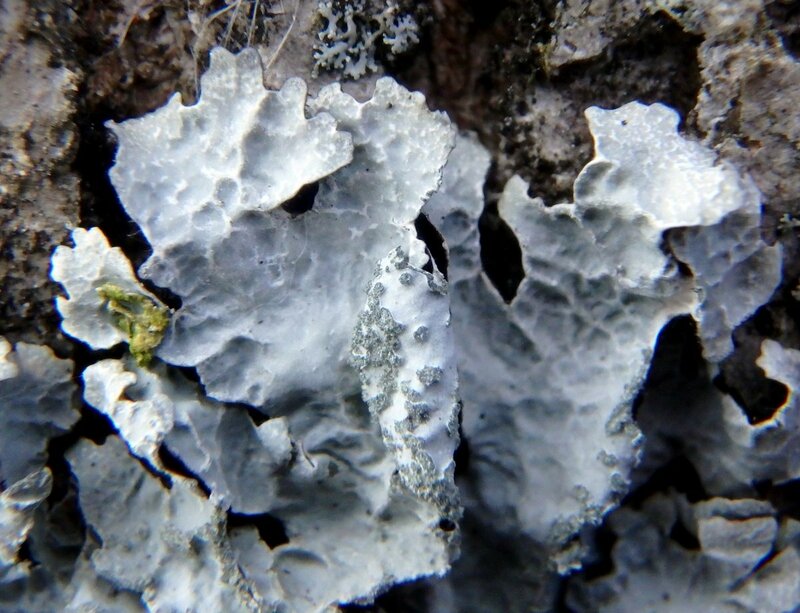 If you look to the upper left corner of this lichen you will be able to see the size difference between it and the fringed candle flame lichen shown previously. Anyone who has seen the film Jumanji with Robin Williams has seen downtown Keene but they probably didn’t even know it. Many of the exterior scenes, including the animal stampede on Main Street, were filmed here. 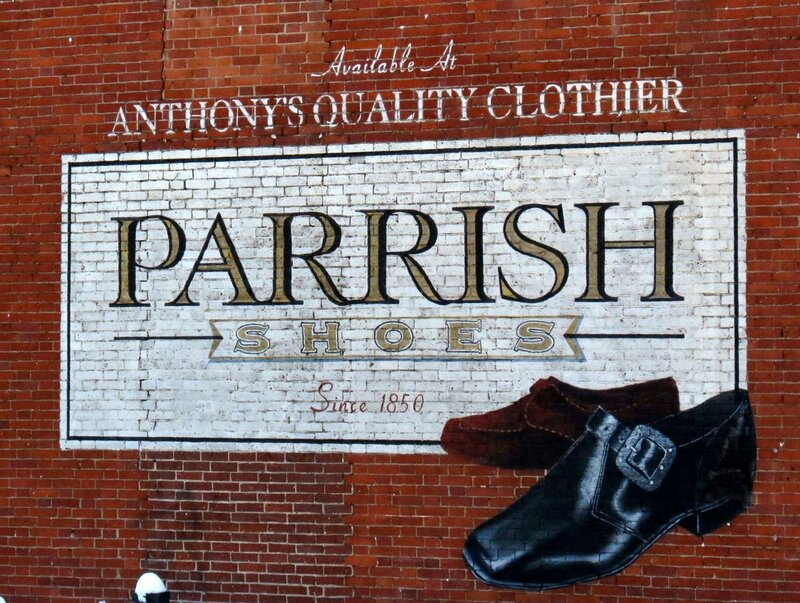 The film crew painted this sign for a business that never existed on the wall of a downtown building and after Robin Williams died a large memorial covered the entire sidewalk for a few weeks. He was a nice guy who truly enjoyed meeting people, and he became friends with some of our local residents. Next time you watch the movie watch for this sign and you’ll know that you’re seeing downtown Keene. I wonder if the film crew got the idea for their make believe sign from this one, which is the real thing. 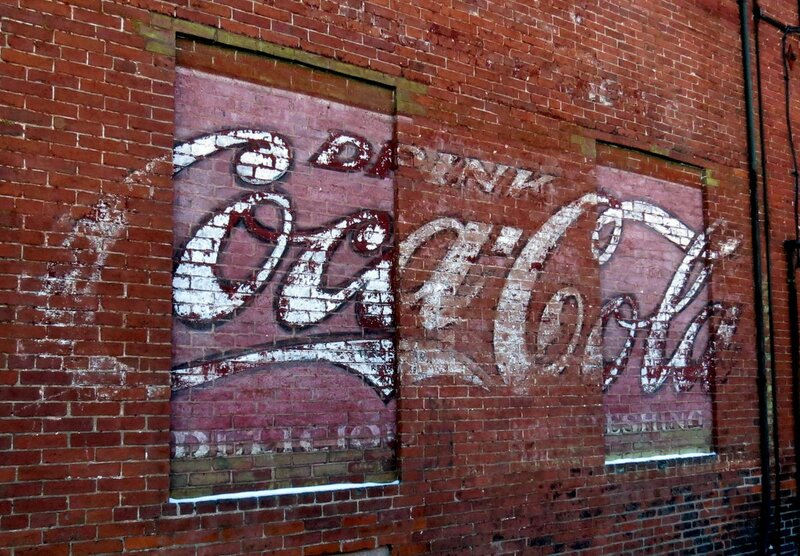 There is another similar one on the side of another building and both have been here for at least as long as I have. This building housed a well-known drug store for many years and when I was a boy I used to save up my money and buy my grandmother a box of Russell Stover chocolates from them on Valentine’s Day. Of course she would always share them with me and that usually meant that I’d get to eat three to her one. I always looked forward to Valentine’s Day back then. Someone had some time on their hands. And probably gloves, too. 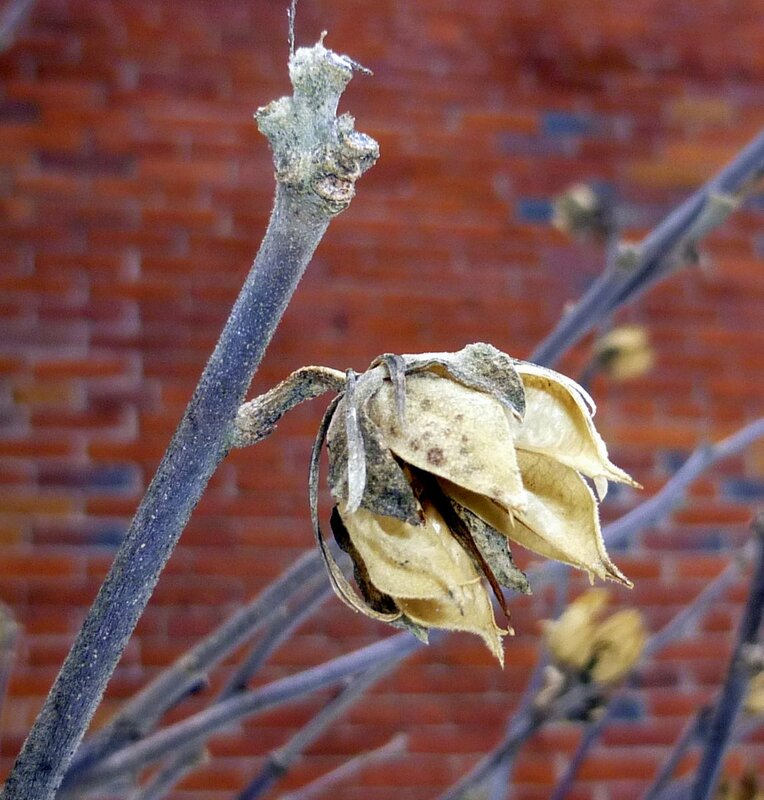 This rose of Sharon (Hibiscus syriacus) was loaded with seed pods. I wonder if their seeds are viable; I can’t remember ever finding a seedling. This shrub is in the mallow family and its flowers resemble those of hibiscus, hollyhocks, and mallows. I always think of it as a hardy hibiscus, probably because I pruned hundreds of hibiscus when I worked as a gardener in Florida. That’s probably also why you won’t find a rose of Sharon growing in my yard. 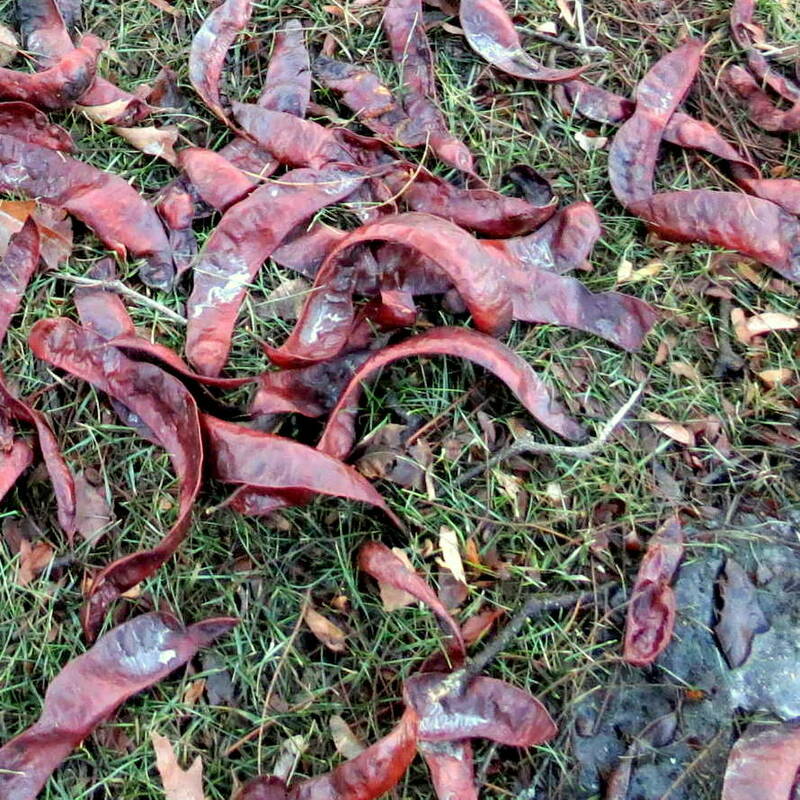 The magnolias had their winter fur coats on. 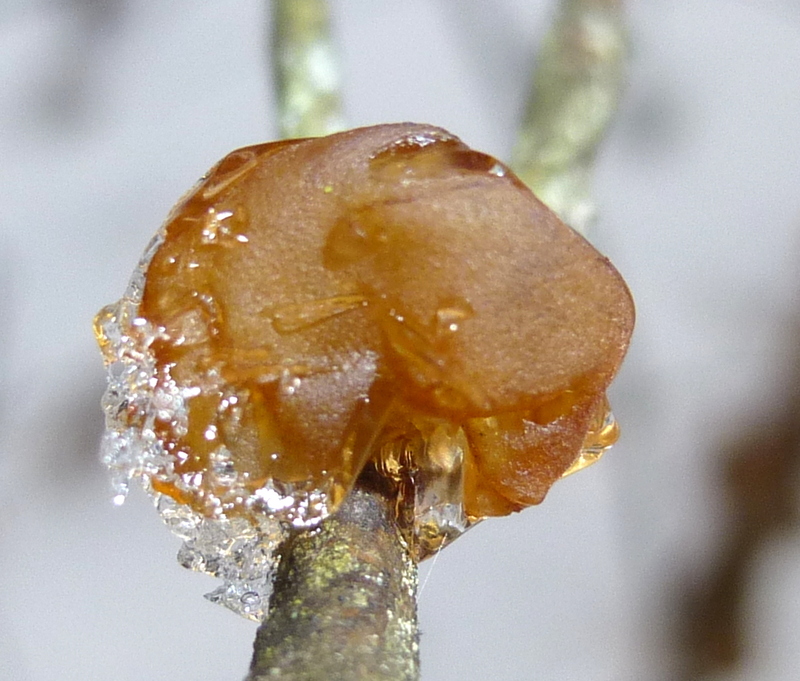 They are of course bud scales that protect the tender bud within from the cold. 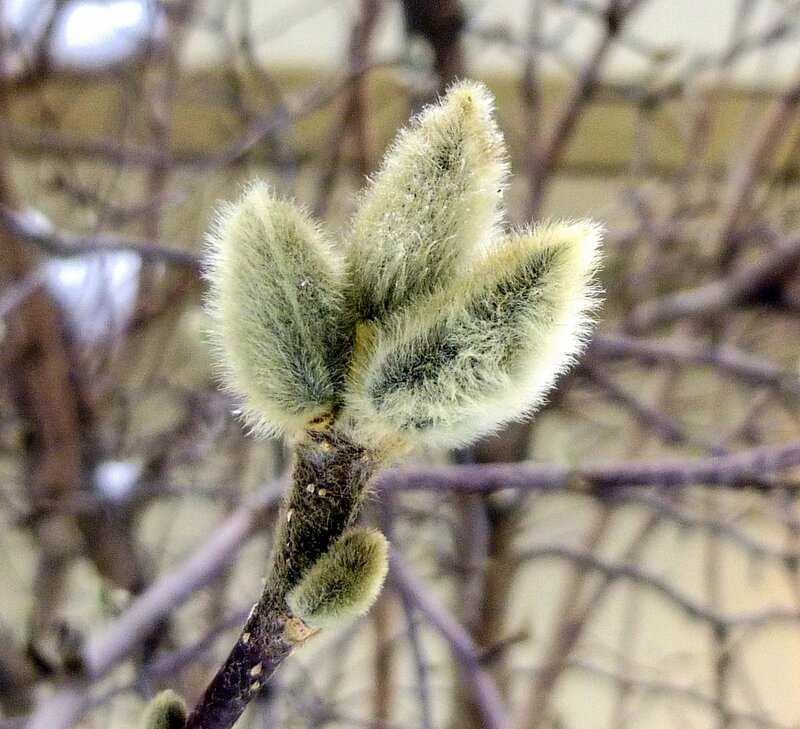 Though some people think that shrubs and trees grow buds in the spring the buds are actually set during the previous year’s growth and only swell up and open in spring. 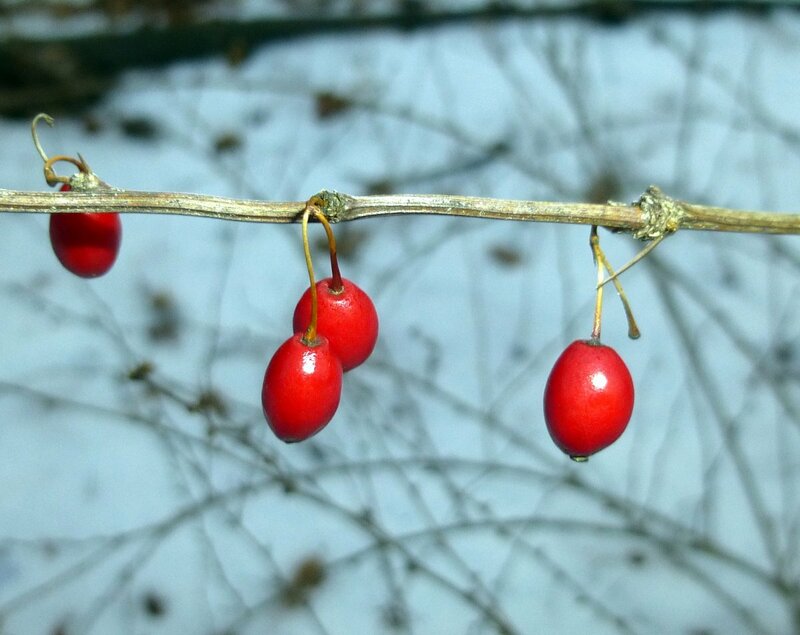 I thought the red of these barberry berries (Berberis) would be appropriate for Valentine’s Day. I’m not sure which plant it is but I am sure that it’s an ornamental rather than an invasive species. Birds had eaten most of the fruit but there were a few left. 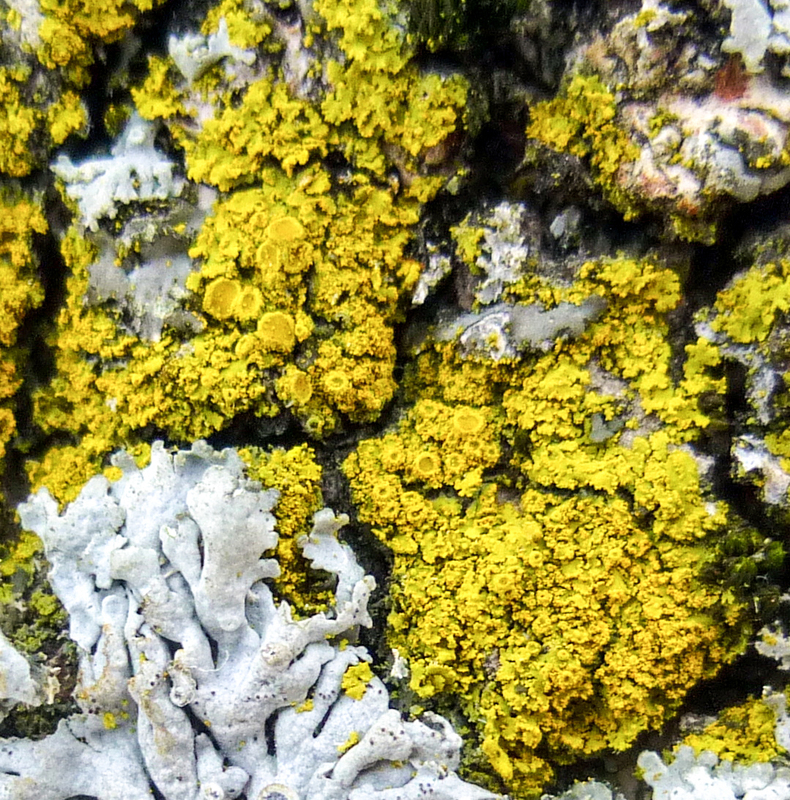 All of the plants and lichens in this post (and many more) grow in plain sight on the streets of Keene, but I doubt that most of the hundreds of people who pass them by every day even know that they’re there. Thanks for stopping in. Happy Valentine’s Day!